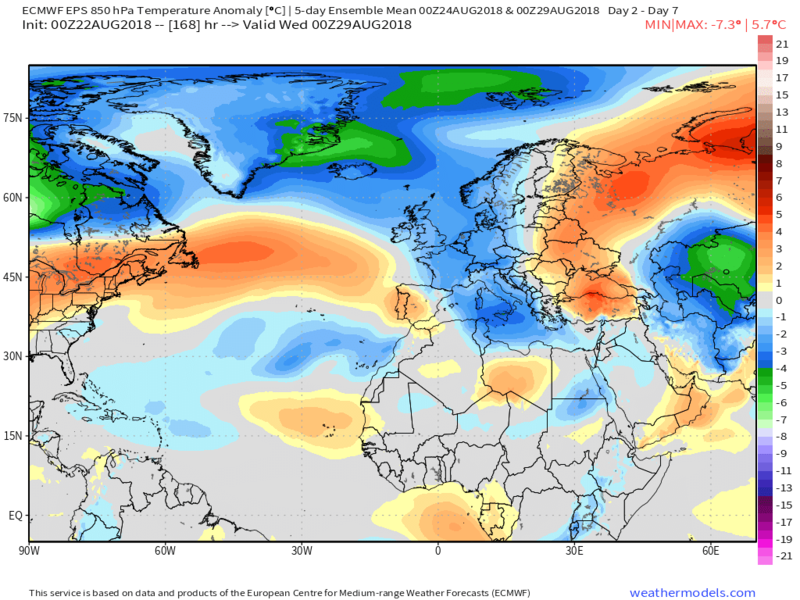 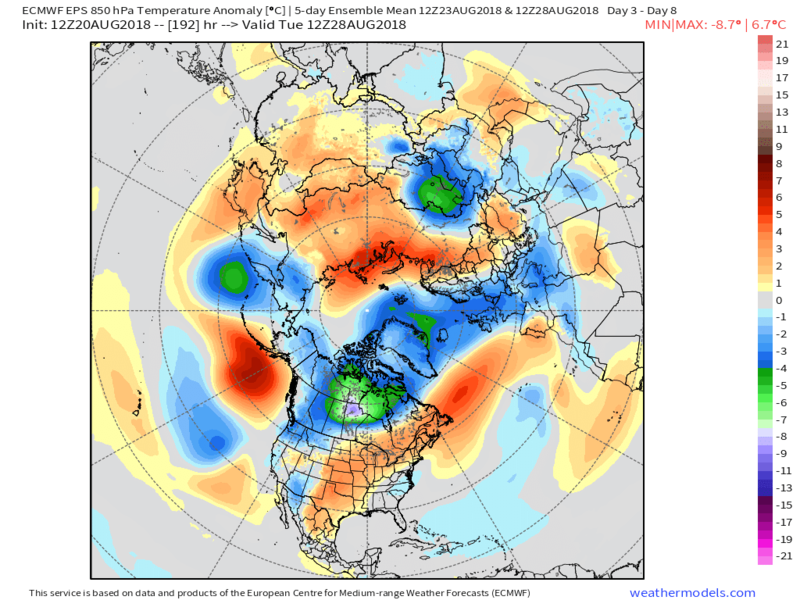 The imminent transition to a cooler and generally more unsettled period has been well signposted for days so no need to labour the point here but suffice it just to post last evening’s EPS medium range anomalies. 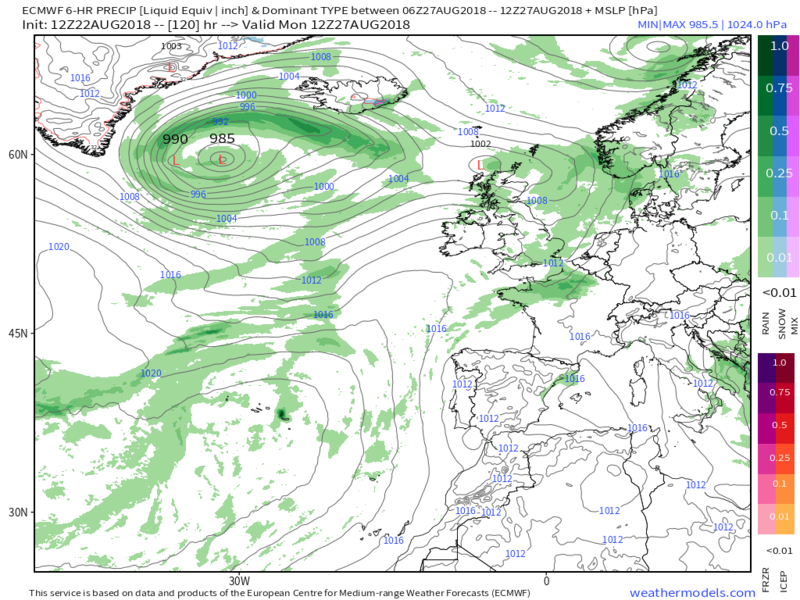 It doesn’t bode well for the weekend but it is the detail within this framework that is posing the questions and that the det runs will eventually answer. 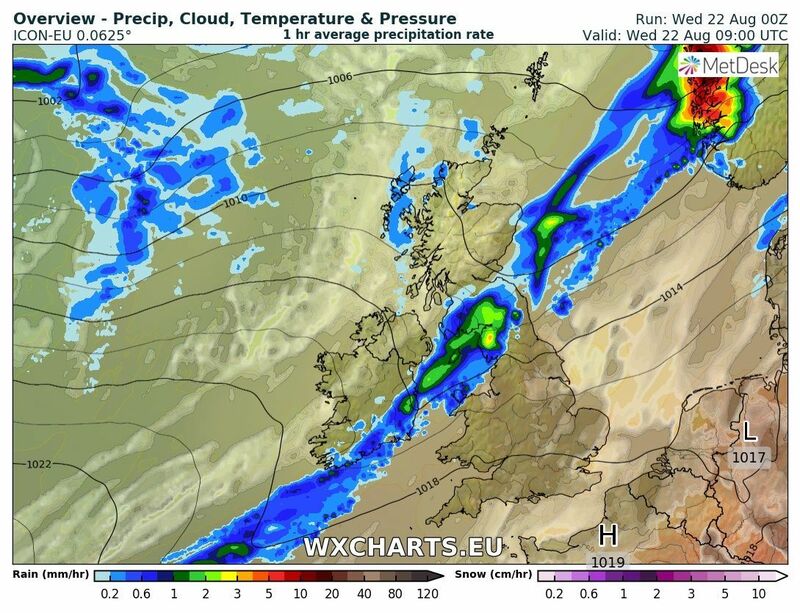 But as can be seen a deepening wave to west is tracking north east just west of Ireland and by early evening this has brought cloud and rain into N. Ireland and western Scotland. 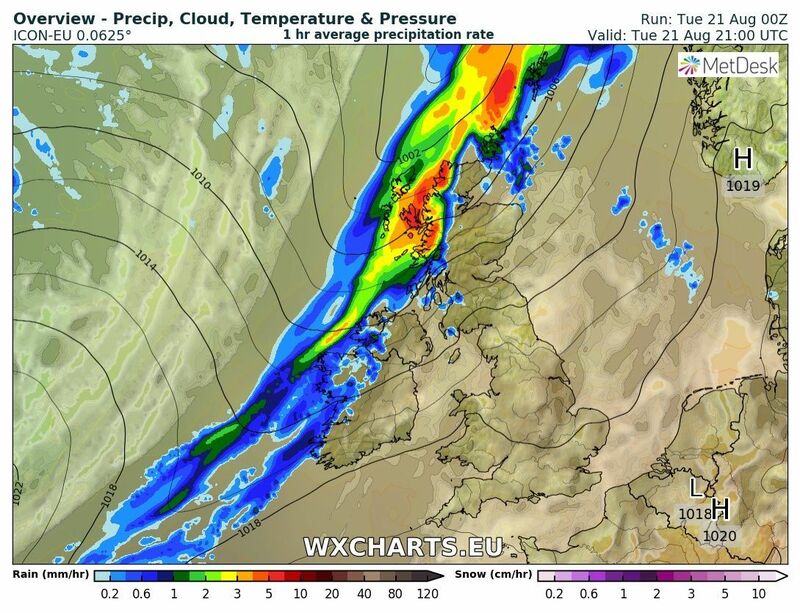 The low continues to track north east as the associated cold front and band of rain moves south east across the country overnight Tuesday through Wednesday and the passage of this front introduces the cooler air in it's wake. 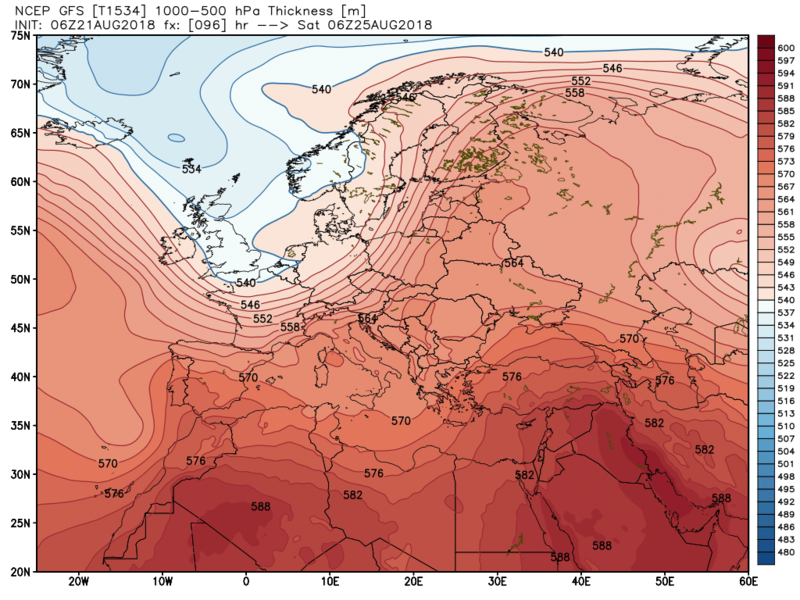 Meanwhile to the south another warm and humid day. 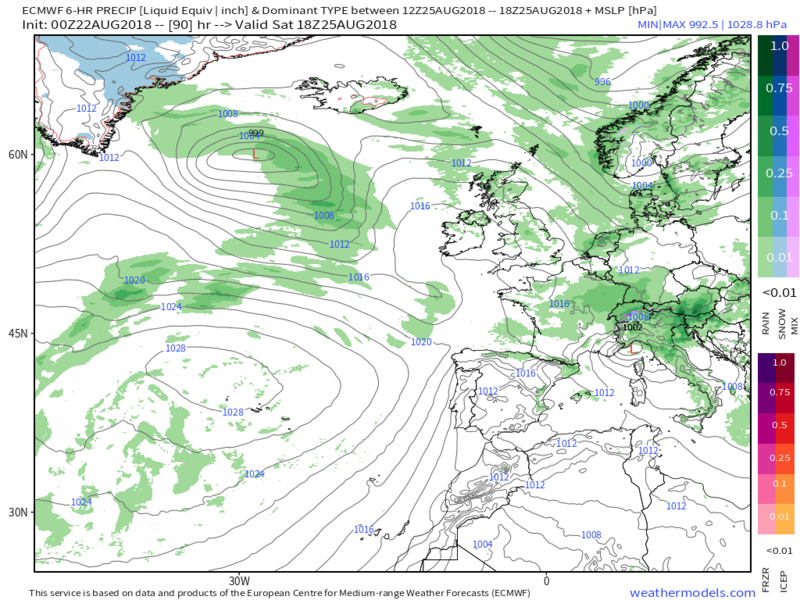 and the cold front is clear of the south coast leaving the UK in a fresh, unstable, north westerly which portends frequent quite heavy showers and sunny intervals with the showery activity more concentrated in the north with possible longer outbreaks where they merge. 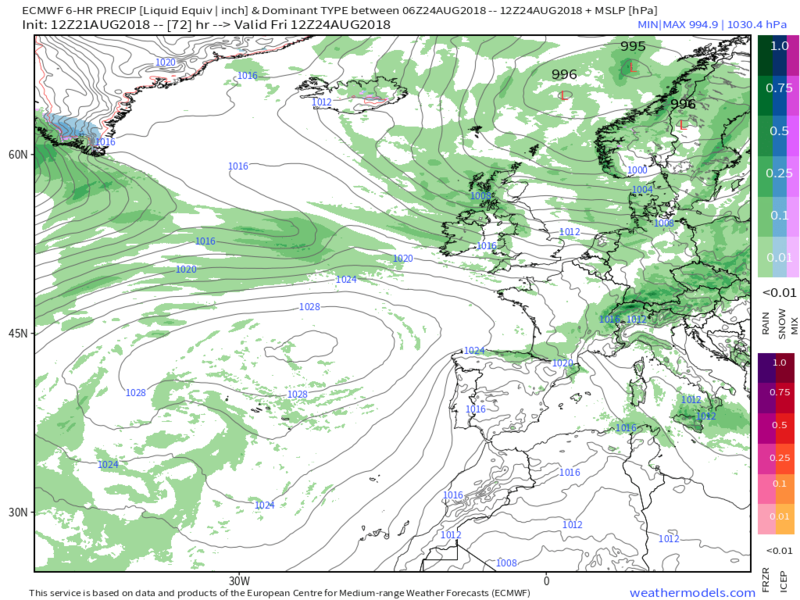 The updated fax and ecm for 1200 Friday. 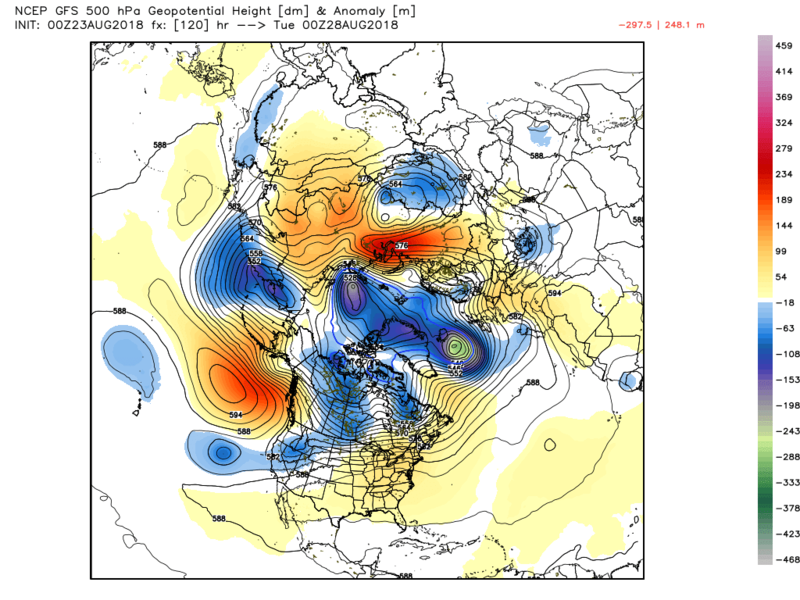 And the ecm follow up. 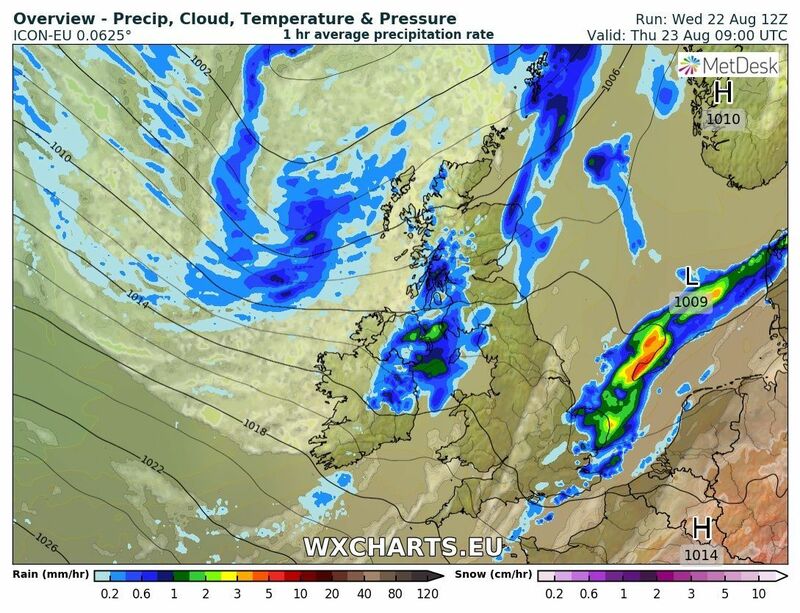 Quite a wet Saturday for England and Wales if that correct but still a fair bit of uncertainty about this. 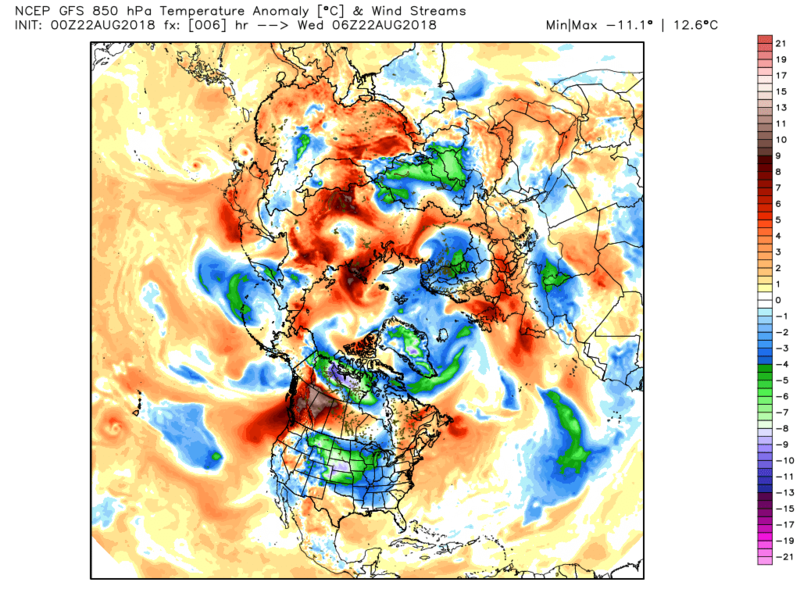 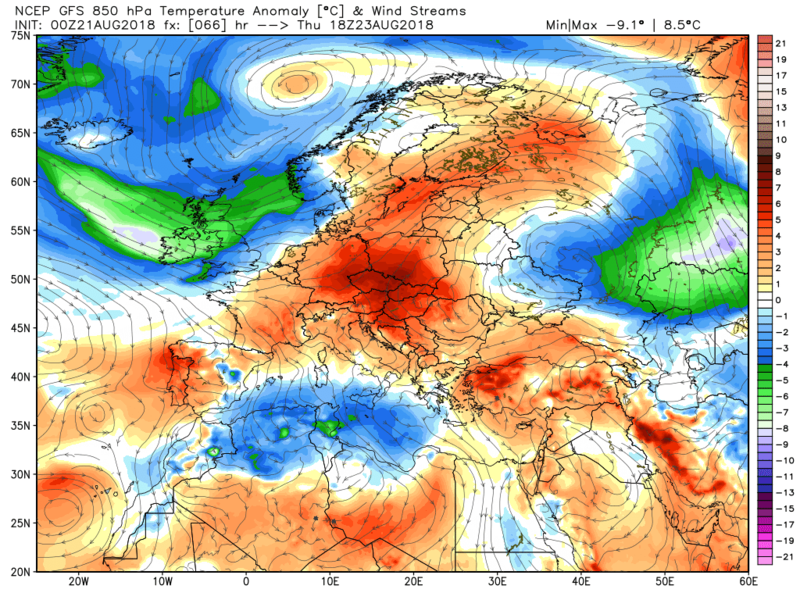 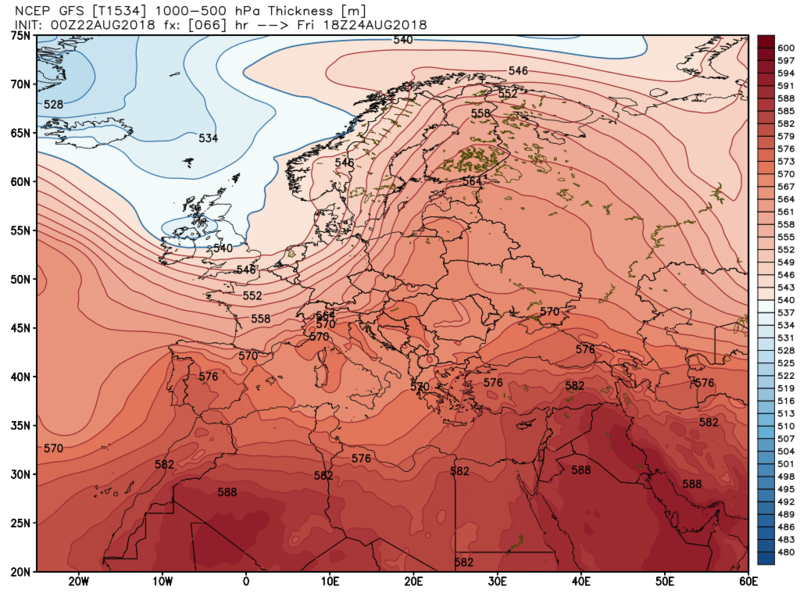 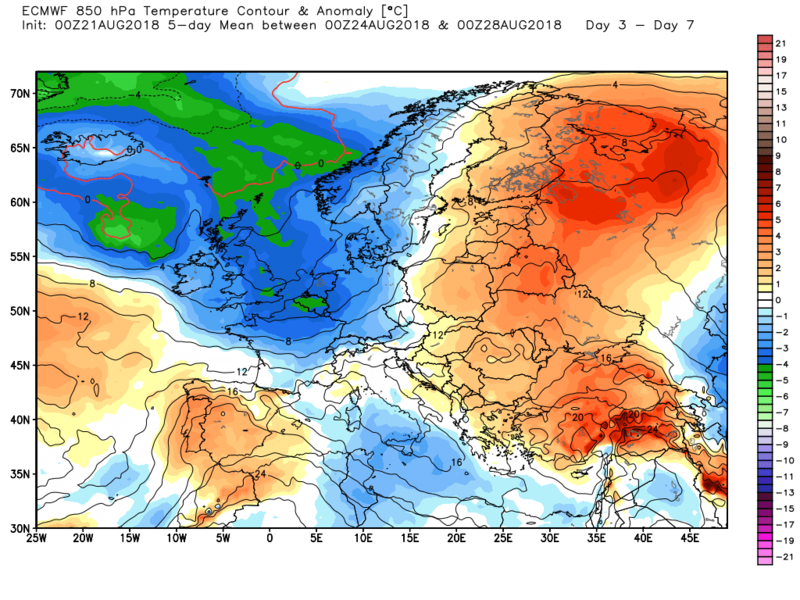 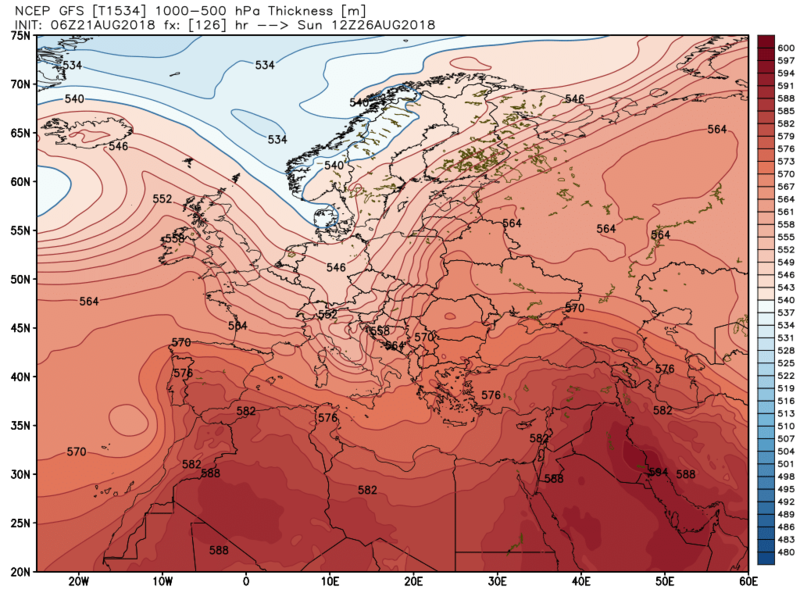 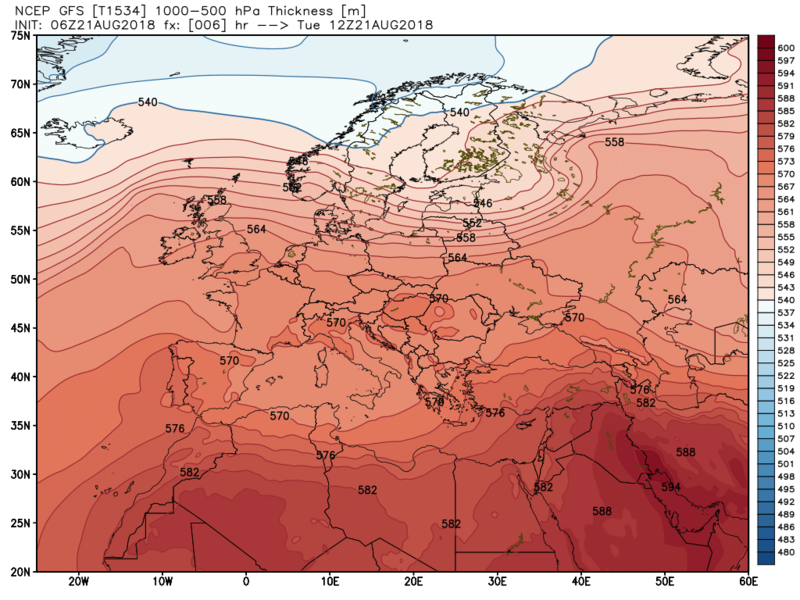 Looks like a very slow cooling down process by weekend over our part of Europe ( Austria ) from the this chart posted by Knocker. 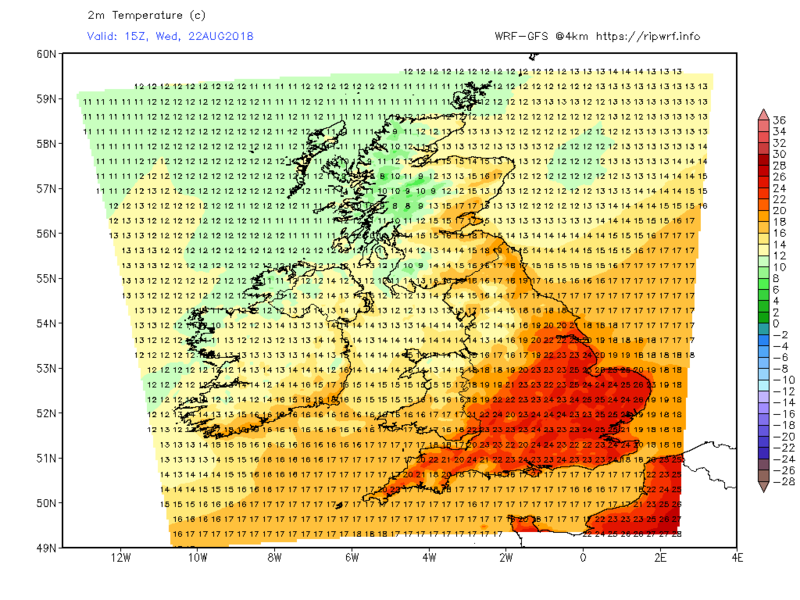 Anyway plenty of warmth and sunshine to be had for most of the week anyway. 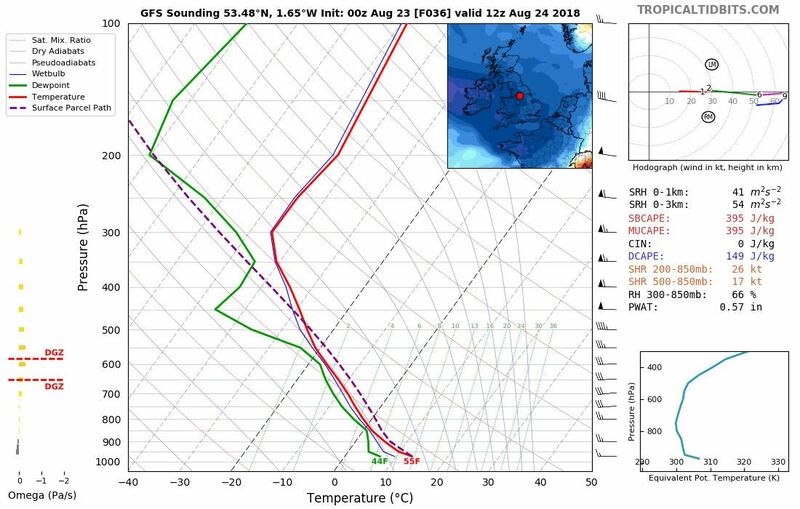 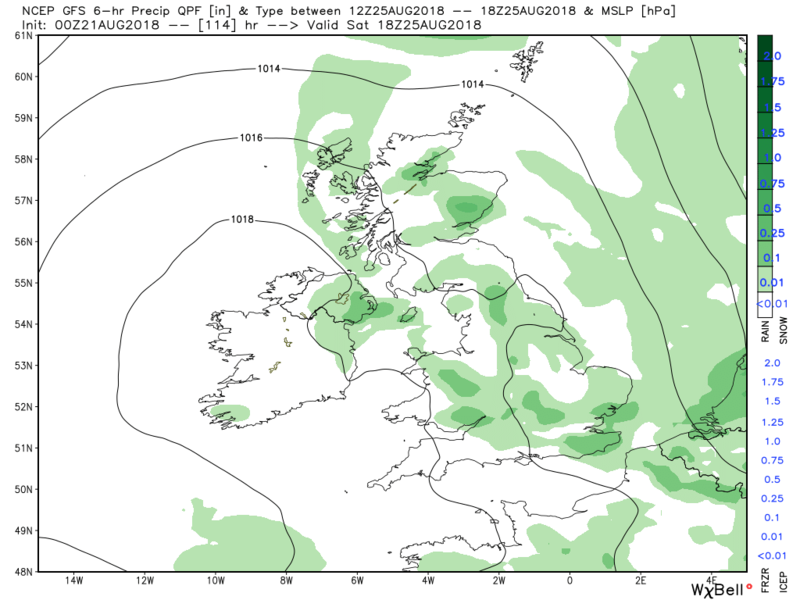 Which tracks south east bringing a wet early Saturday mainly to the west and south of the UK and a very cool day, Then some brief ridging before the next front approached on Sunday. 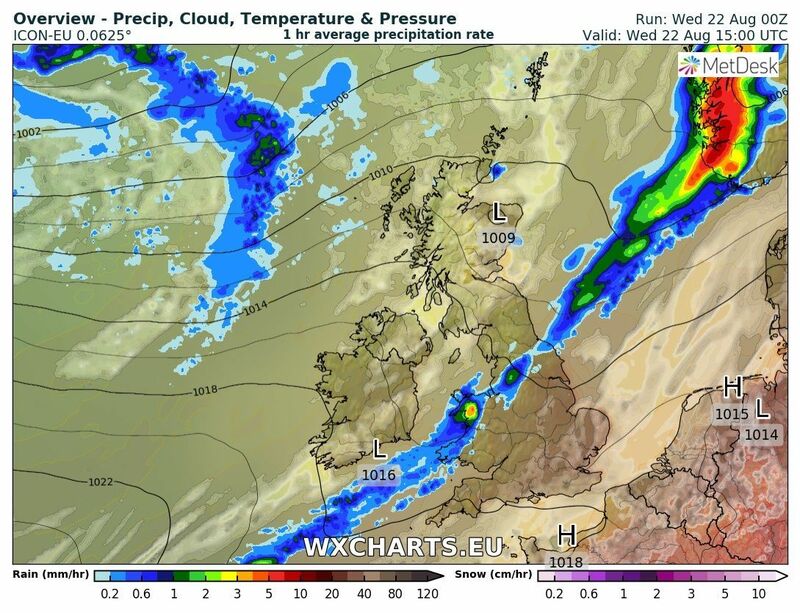 with the cold front and band of rain over southern Scotland. 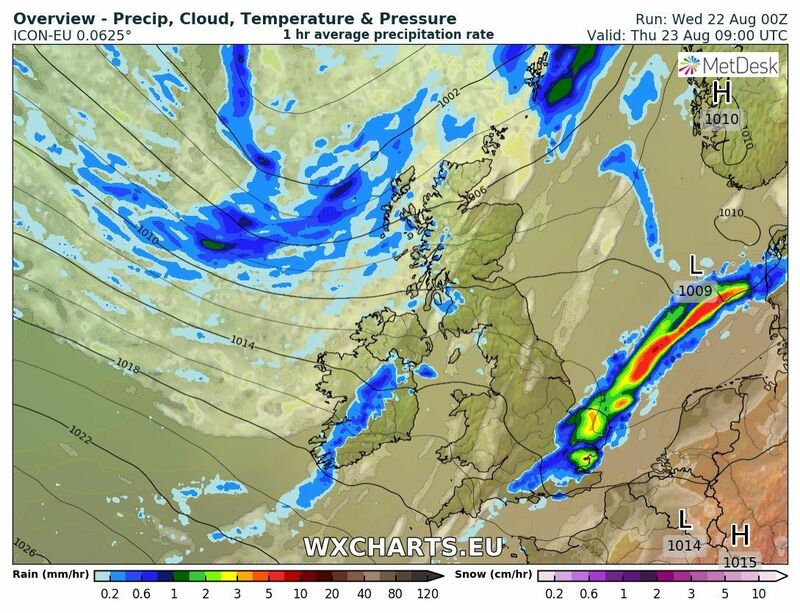 This will track slowly south east during the day leaving cooler and showery conditions in it's wake. 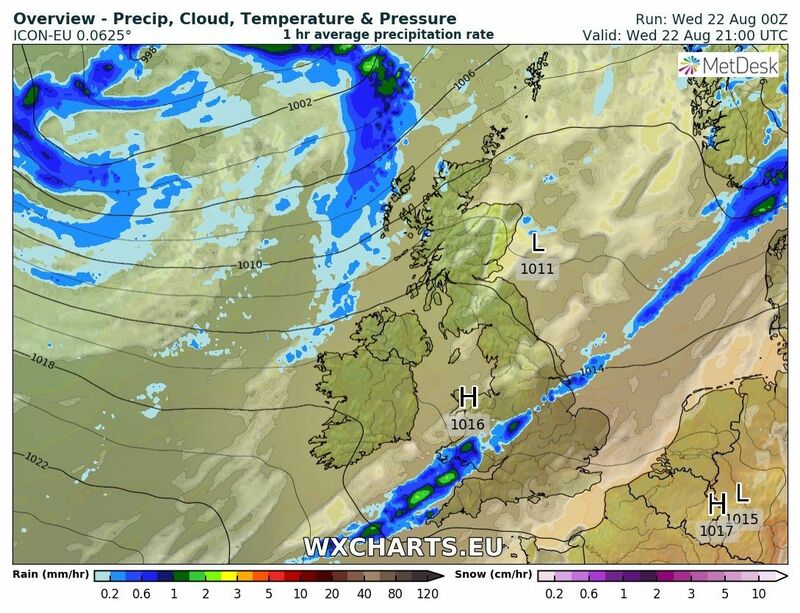 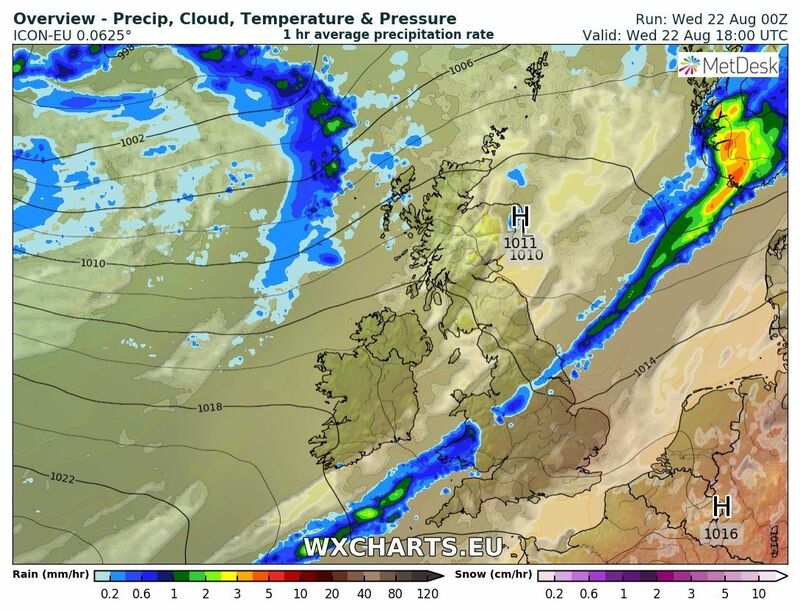 But further south of the front which is still in th warm and humid air, where the cloud breaks it will get very warm. 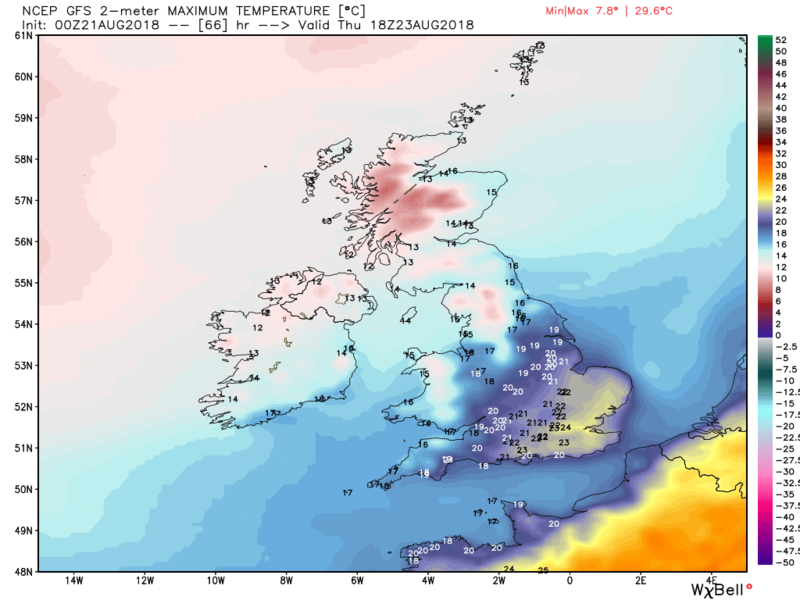 All resulting in quite a latitudinal contrast across the regions. 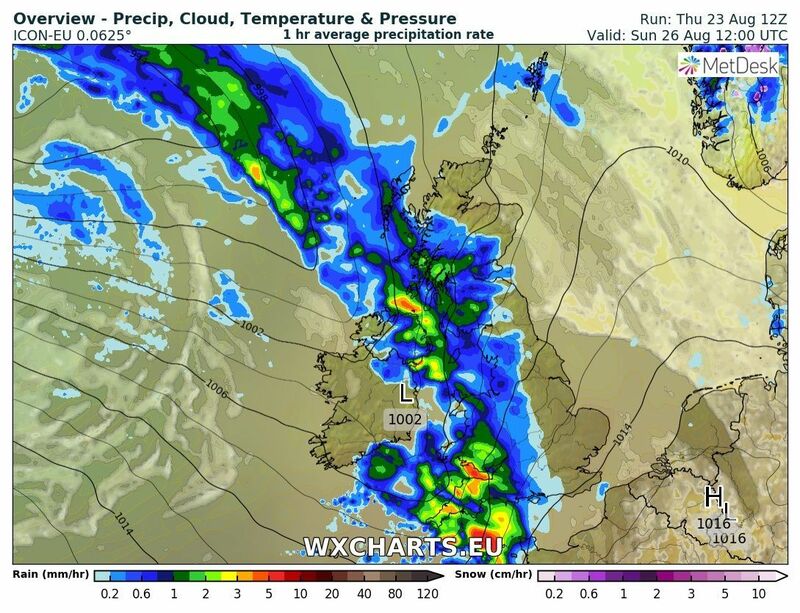 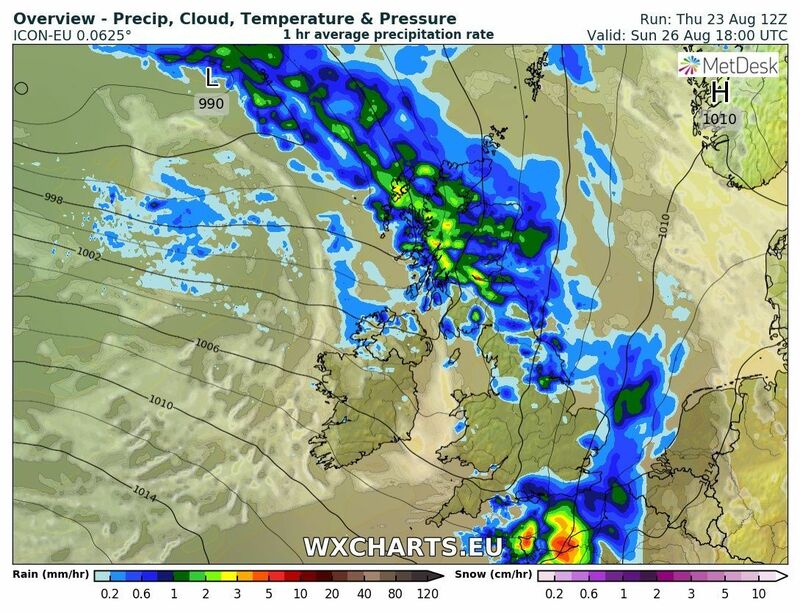 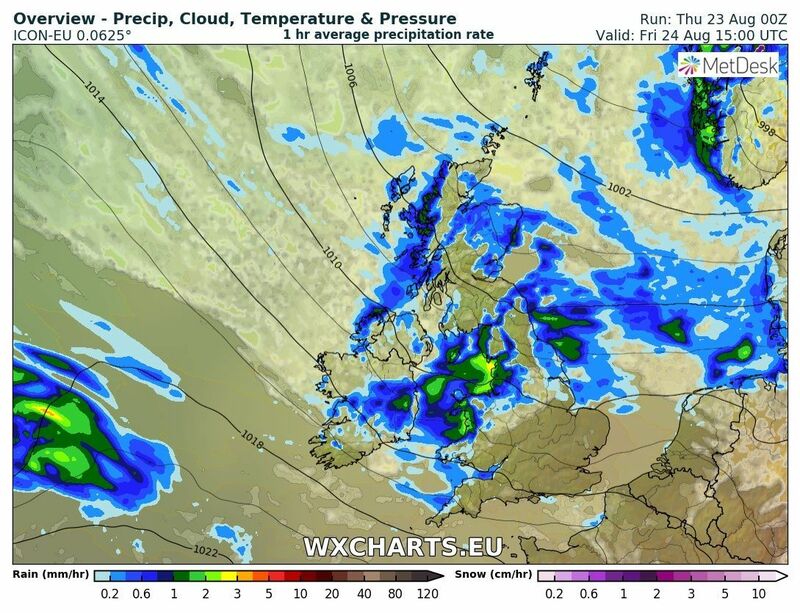 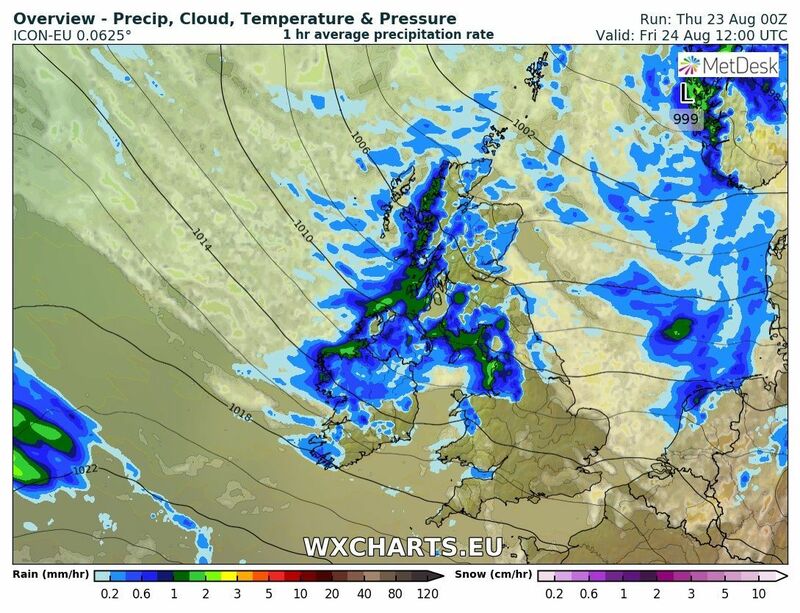 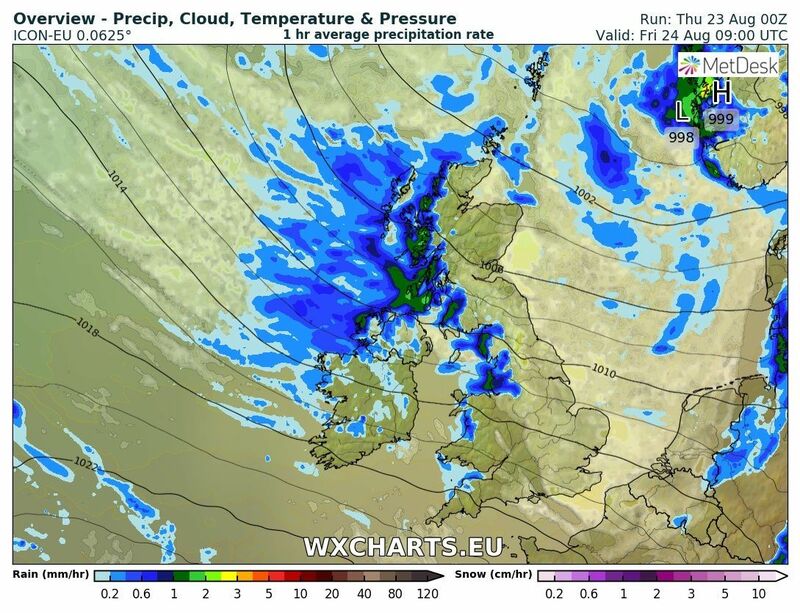 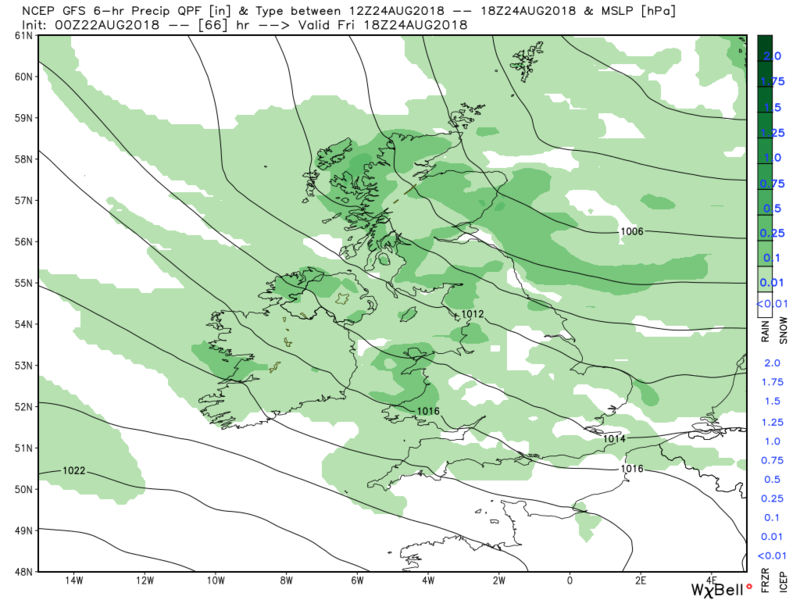 Overnight and through Thursday morning the front and rain continue their travels, the latter pepping up for a time, before clearing around lunchtime leaving the whole of the UK in an unstable and cooler north westerly. 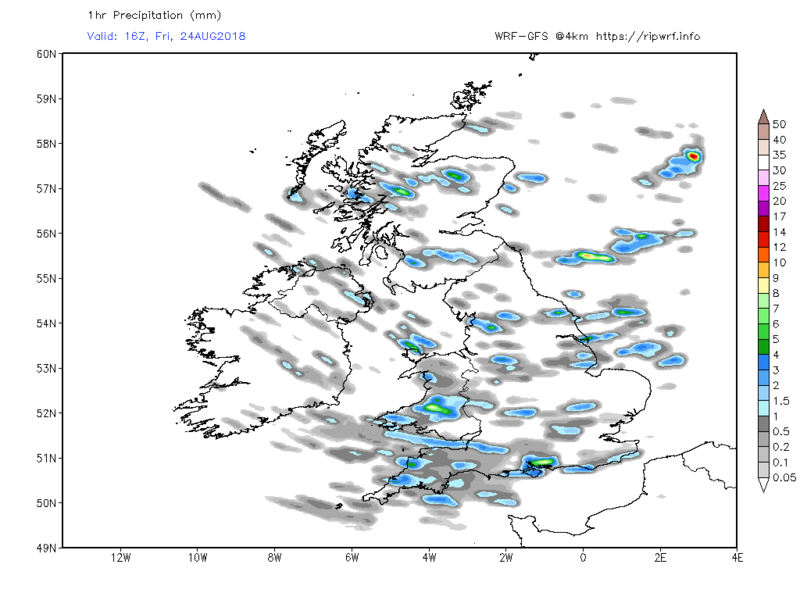 Thus some heavy squally showers , concentrated more in the west and north where another system involving a wrap around occlusion has arrived on the scene. The occlusion also sinks south east through Thursday evening introducing even cooler air so that Friday becomes quite an unpleasant day with a fresh north westerly and frequent showers, and possibly some light frontal rain effecting the south west during the evening, with temps below average. 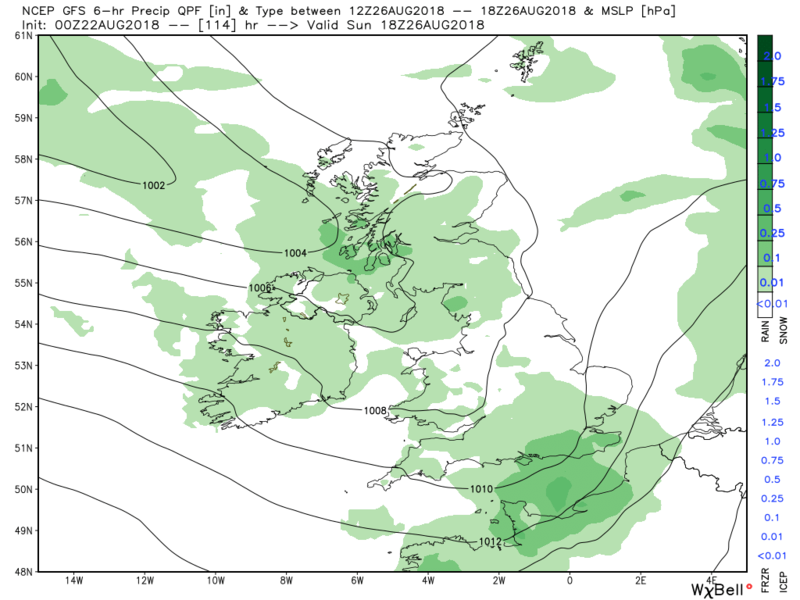 Lighter winds on saturday as a transient ridge passe through but still some showers around and another cool day. 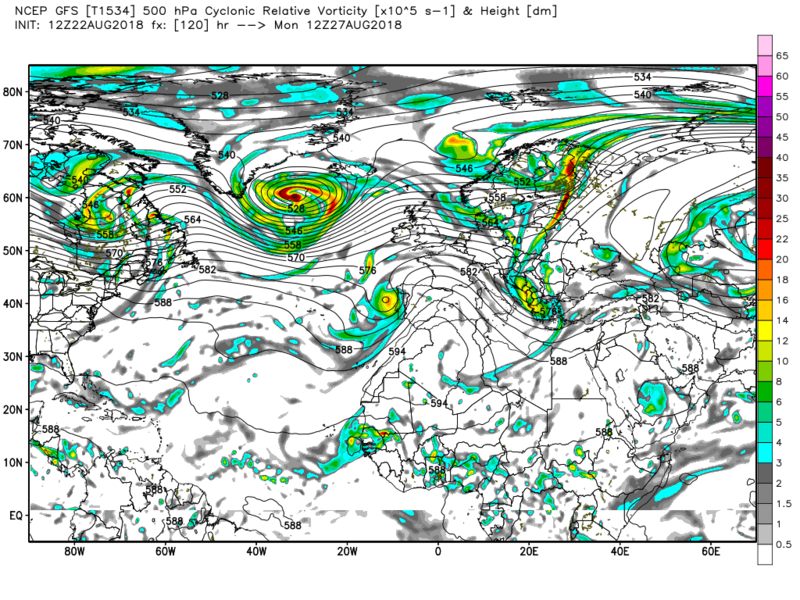 But out to the west the next quite complex system is getting organized and is moving east. 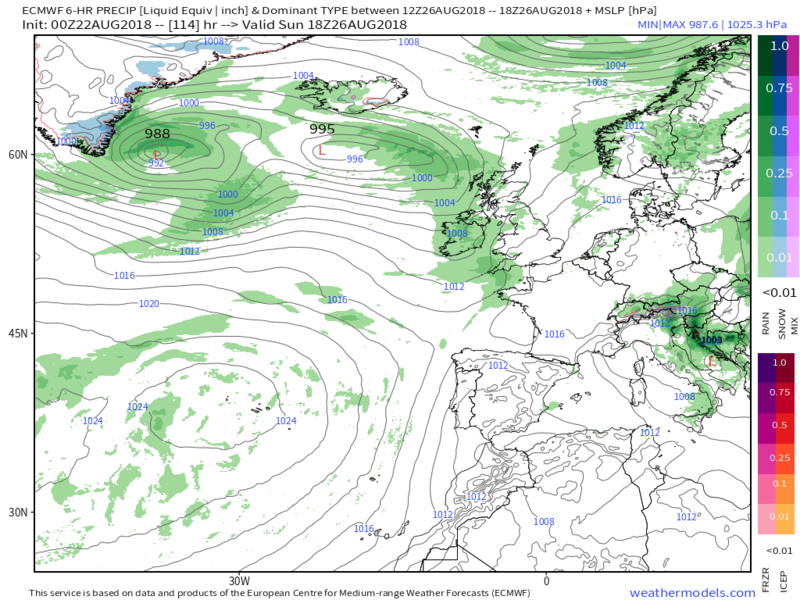 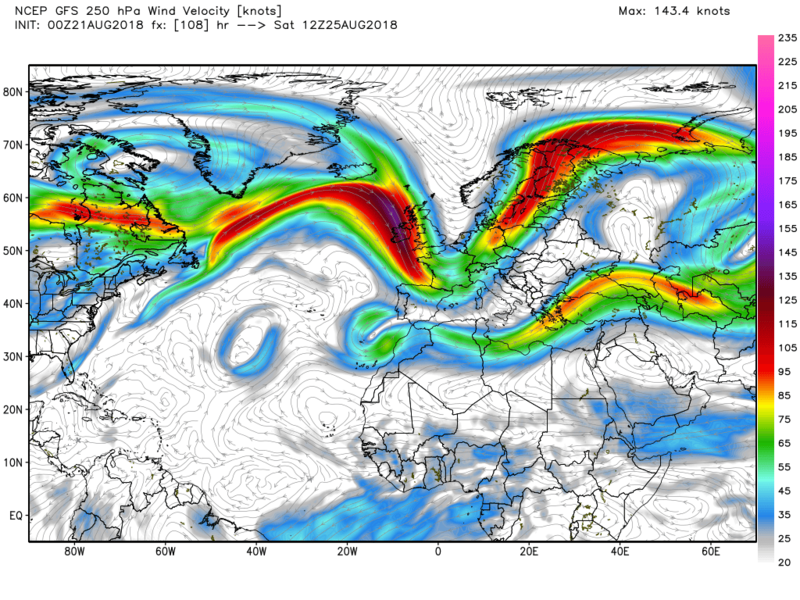 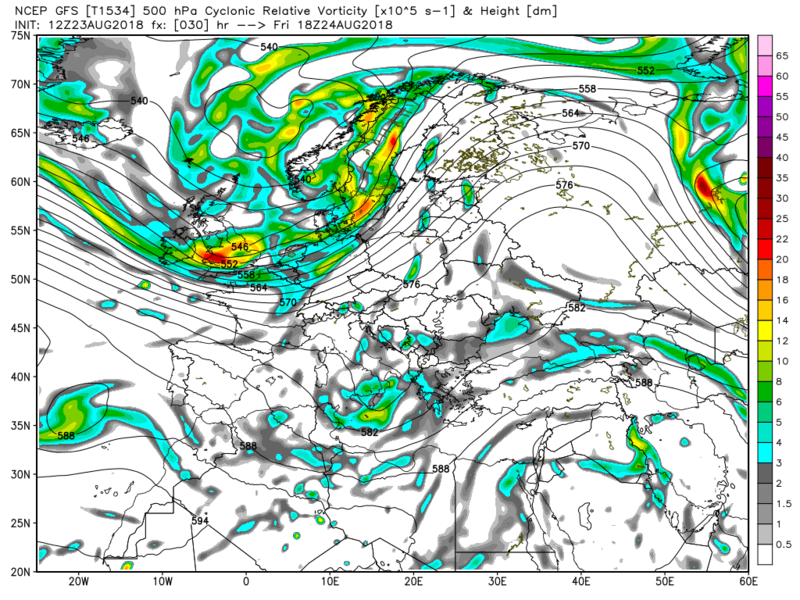 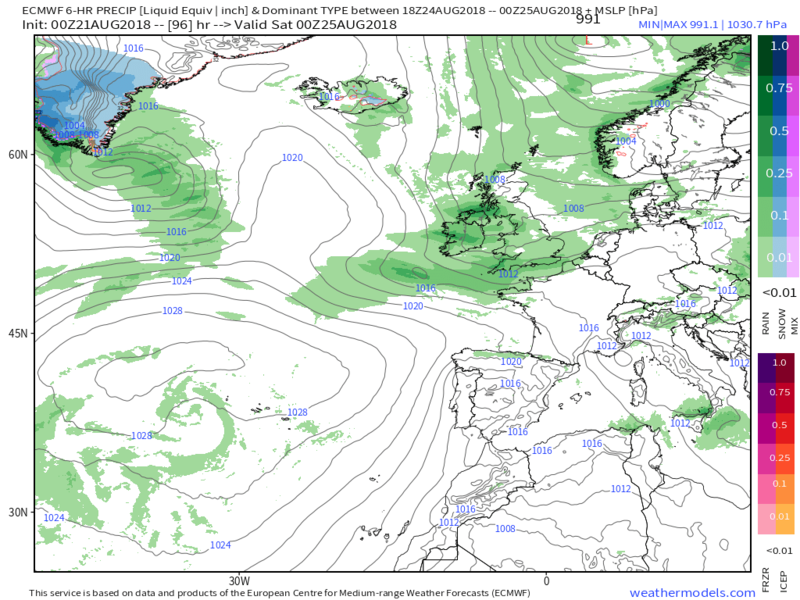 And by 1200 Sunday the low is 992mb south of Iceland and the array of fronts has brought cloud and rain to western parts of the UK which will move east, albeit becoming quite patchy. 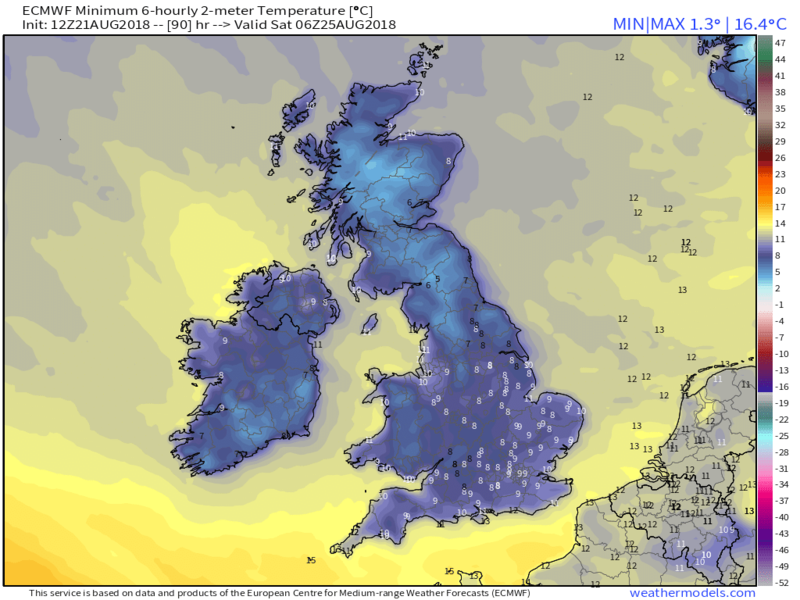 Another quite cool day with temps possibly a little below average. 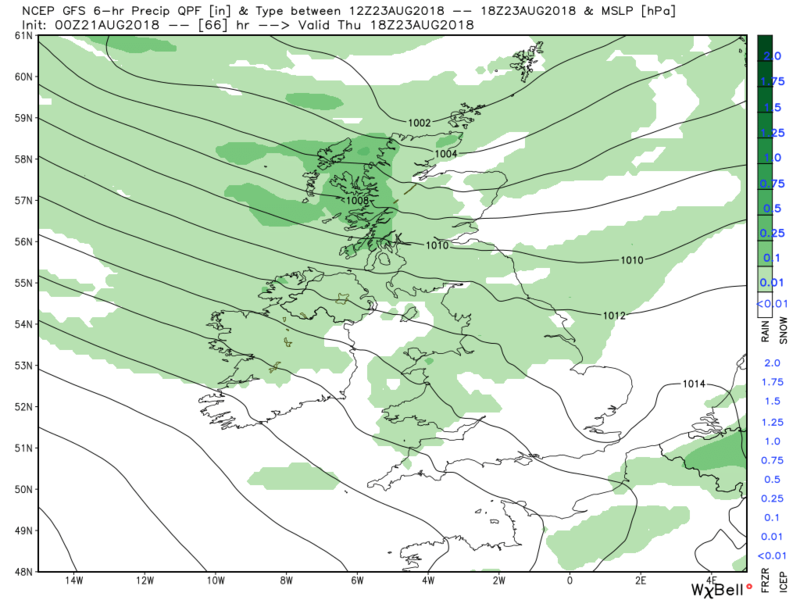 The updated fax charts have an occlusion running south in the circulation in the early hours of Saturday, weakening as it hits the transient ridge, but not before introducing even cooler air to N. Scotland. 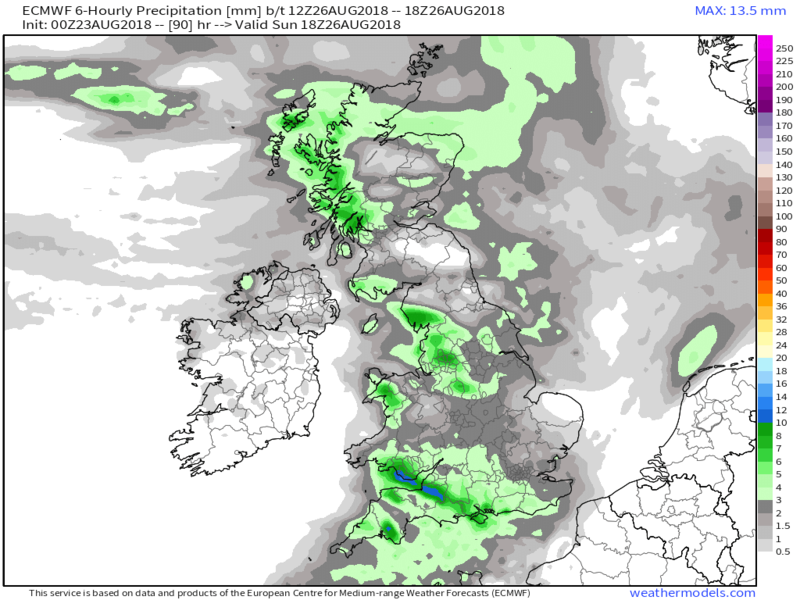 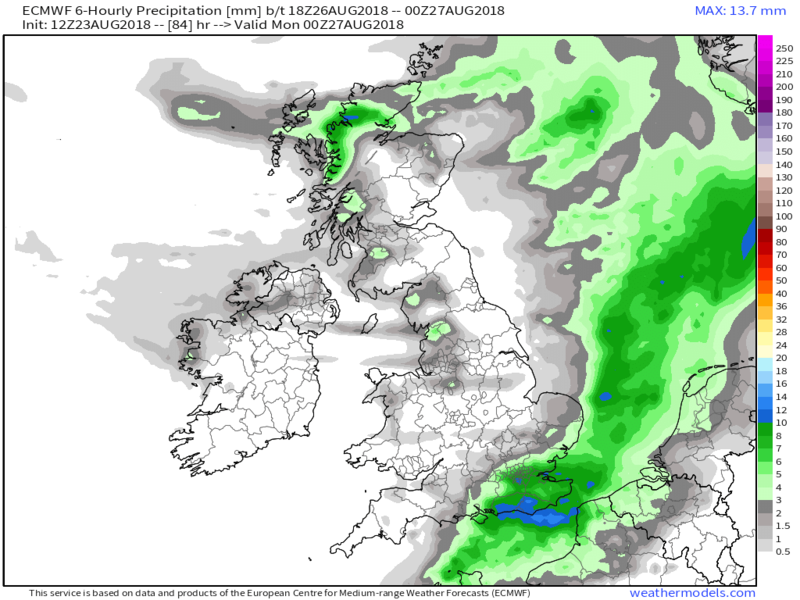 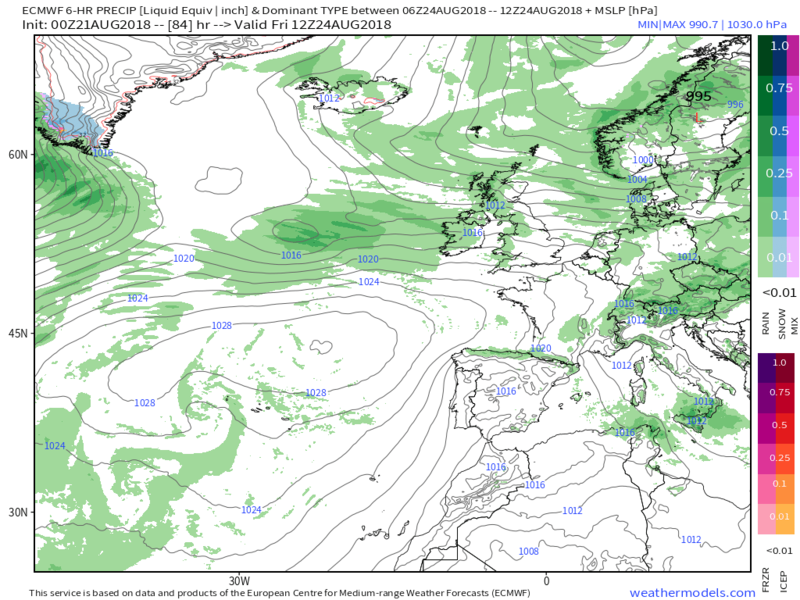 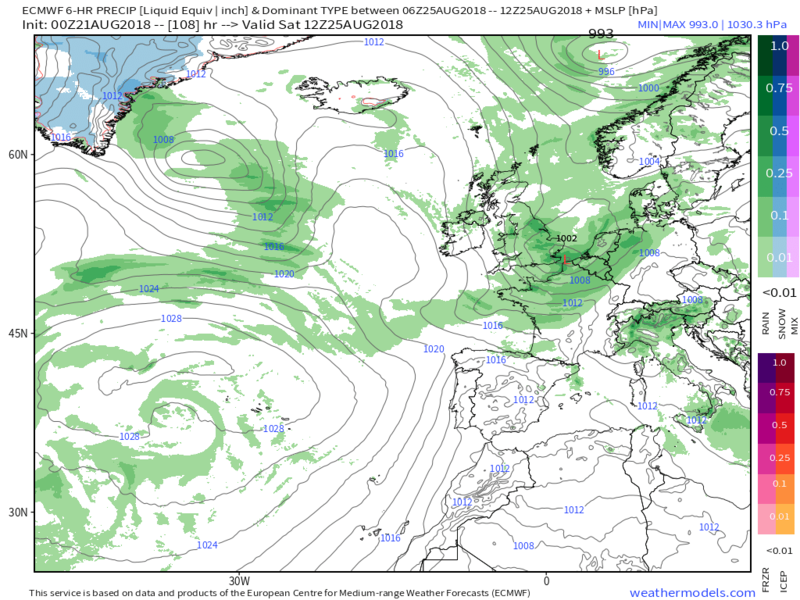 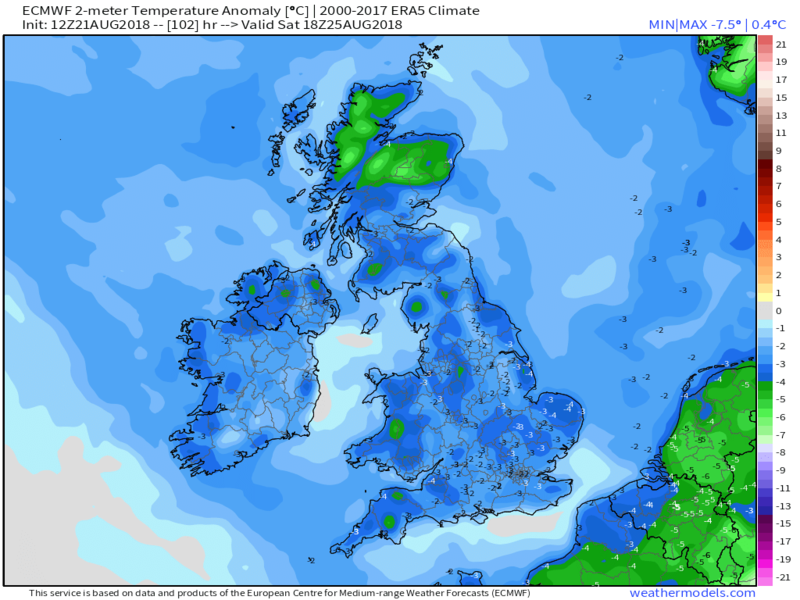 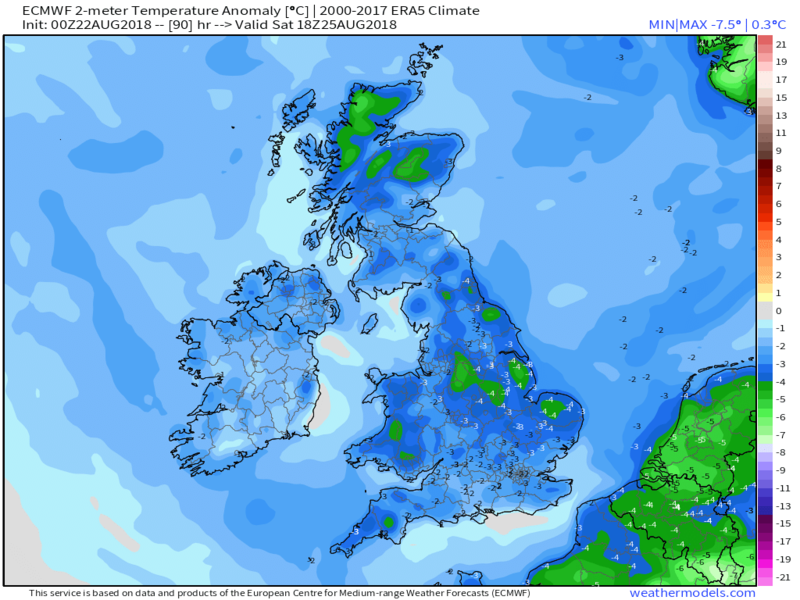 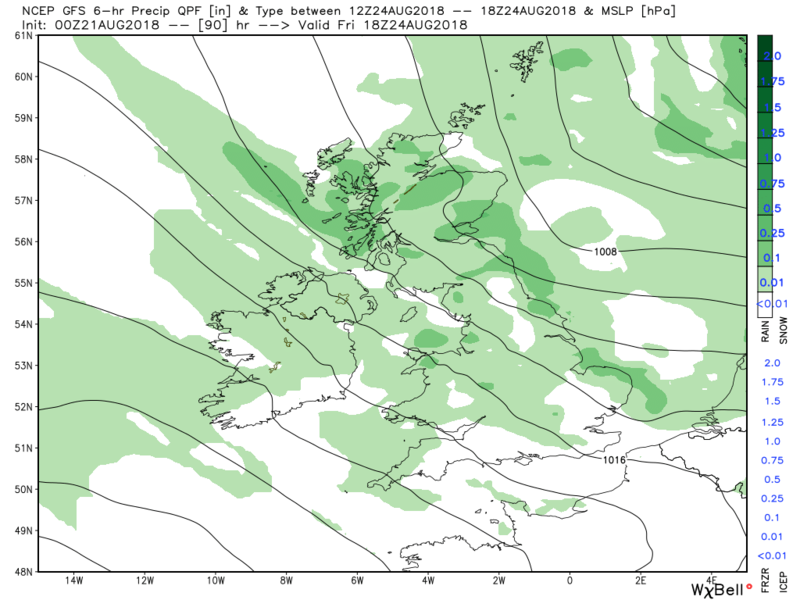 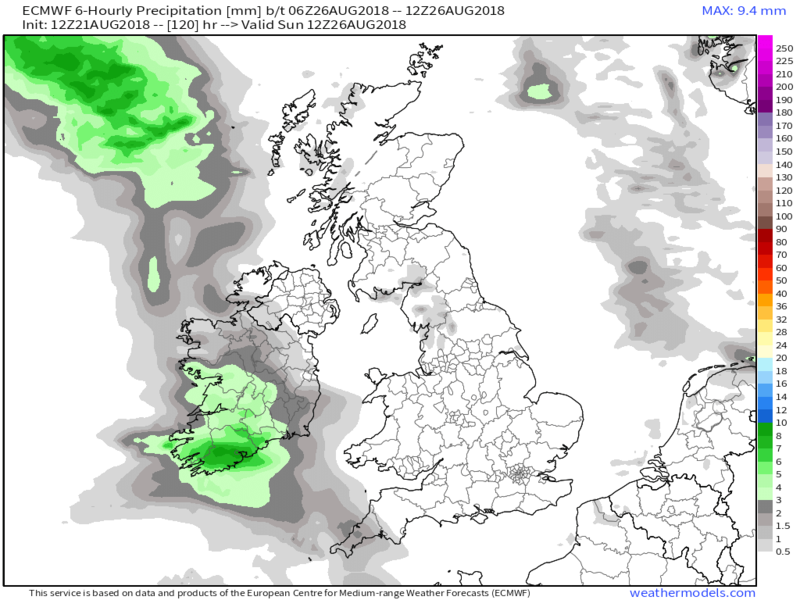 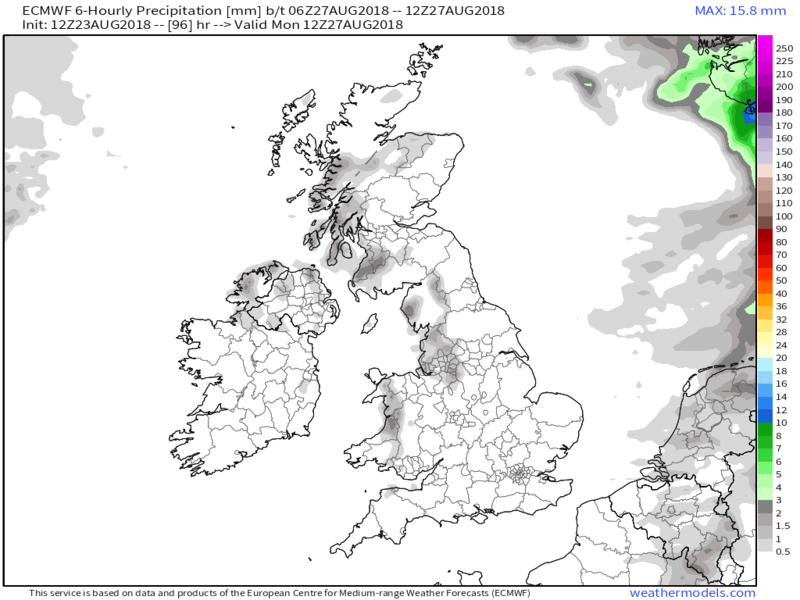 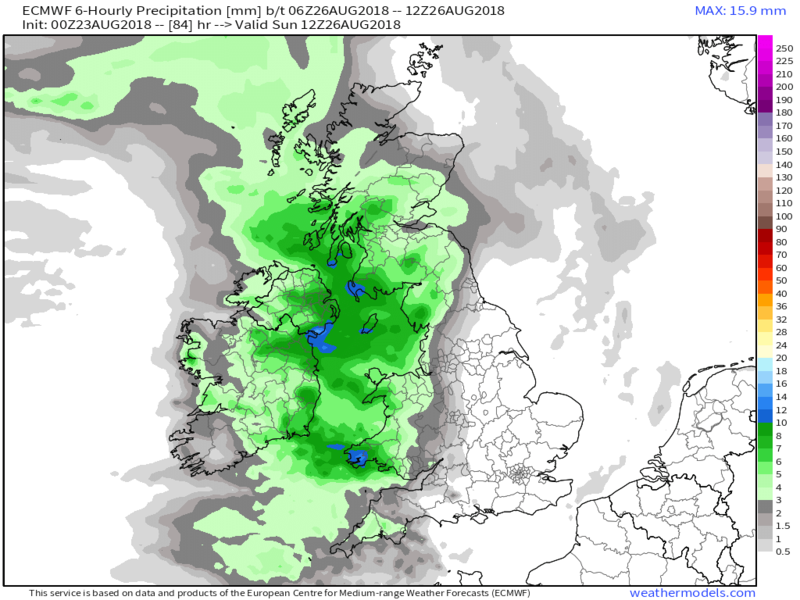 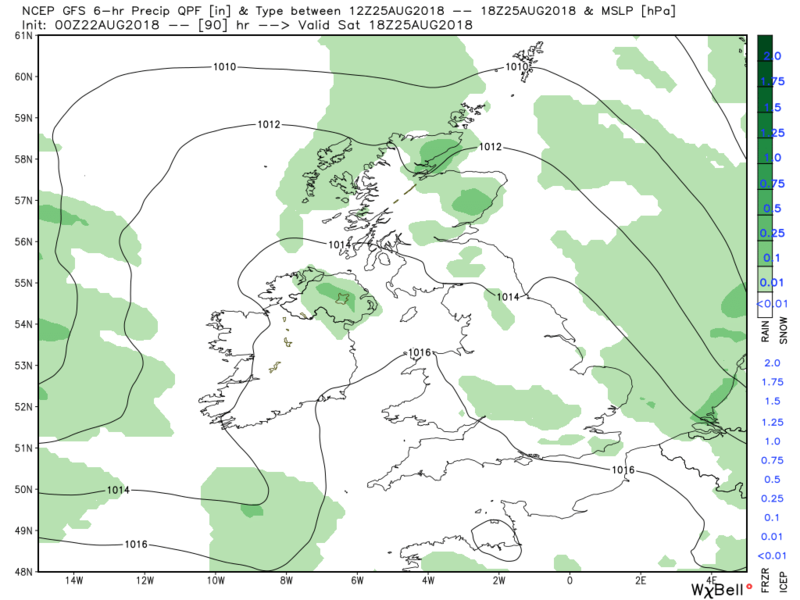 The ecm has Saturday as a showery day with temps below average before another weakening front brings some patchy rain to western regions Sunday evening. 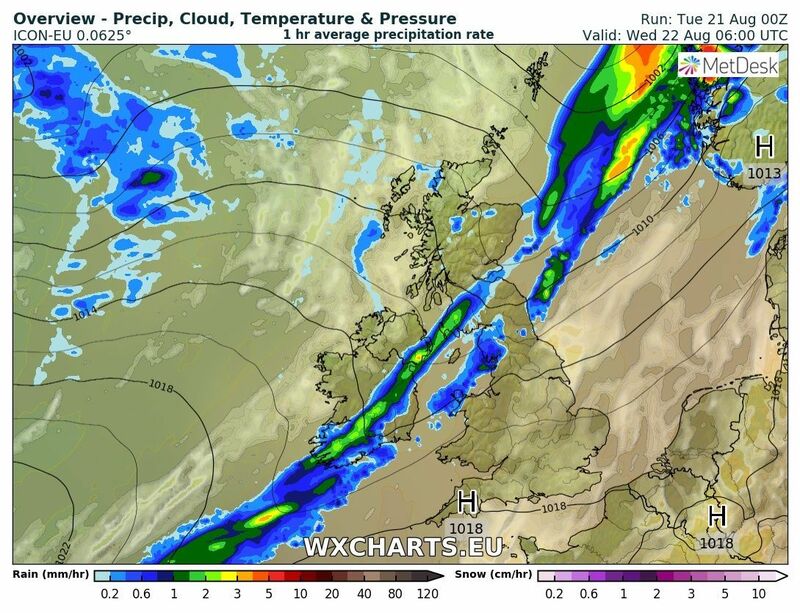 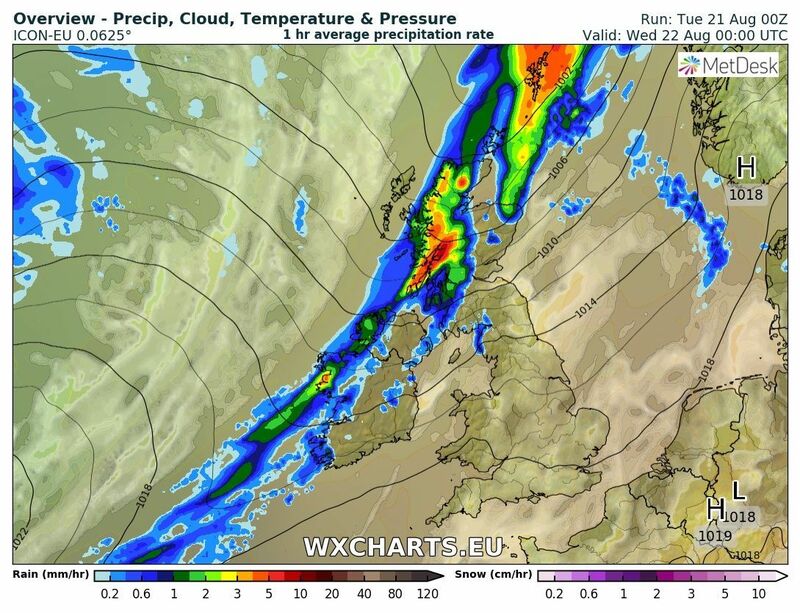 Through this evening and overnight the cold front continues to track south east with the rain belt pepping up somewhat in the early hours whilst further north the occlusion will bring further rain to N. Ireland and western Scotland by midnight which will also track south east but fragmenting a little in the morning. 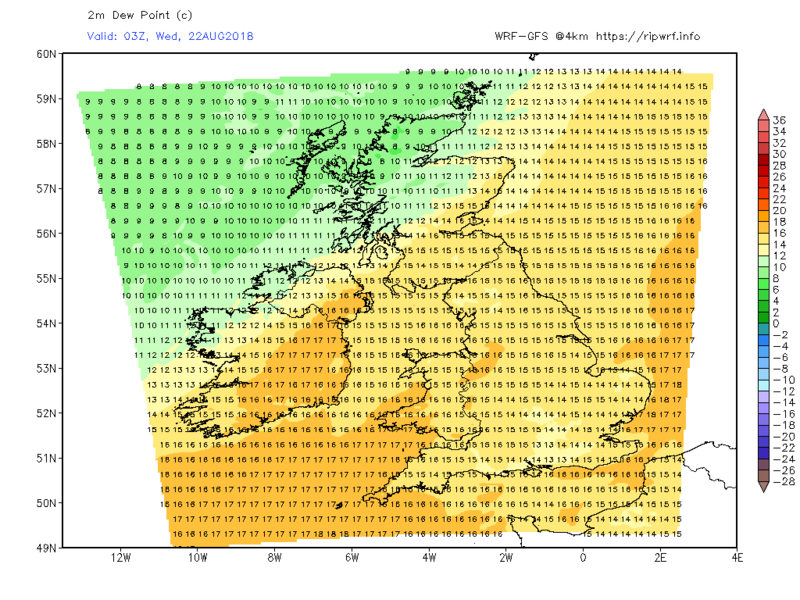 Still quite a warm and humid night in the south east but markedly cooler elsewhere. 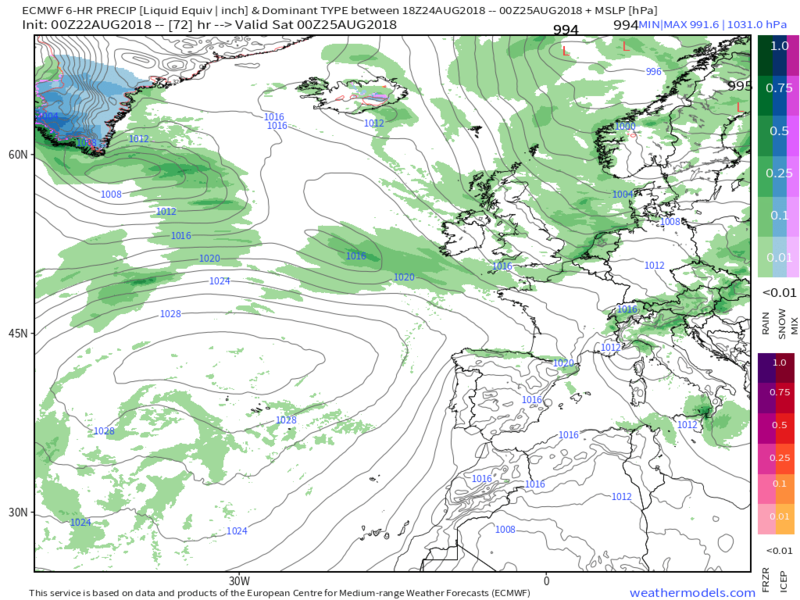 Both this evening's fax and the ecm has the UK in a light north westerly at 12 Saturday with some showers around. 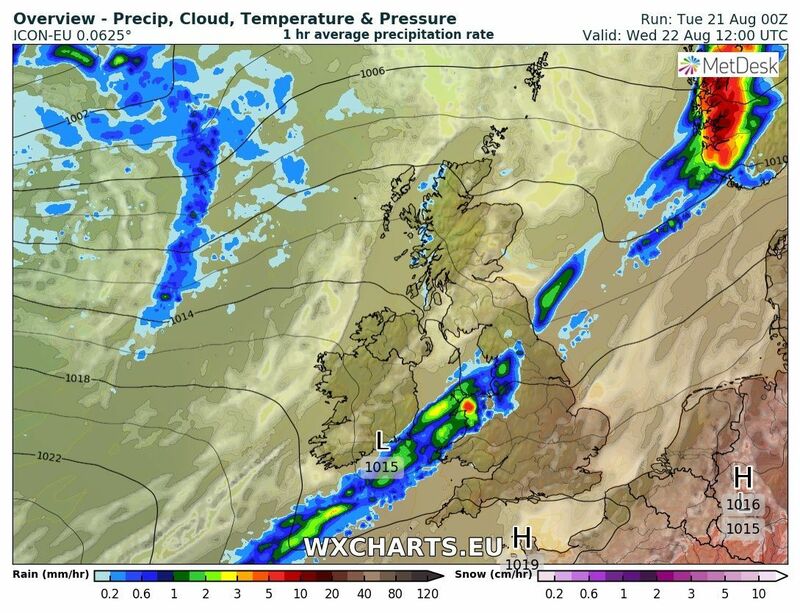 Twenty four hours later fronts from the system to the west have brought cloud and rain into western areas The front is quite active and develops a couple of little waves as it traverses the UK rather concentrating any rain over N. Ireland, Scotland and the south west of England in the early hours of Monday. 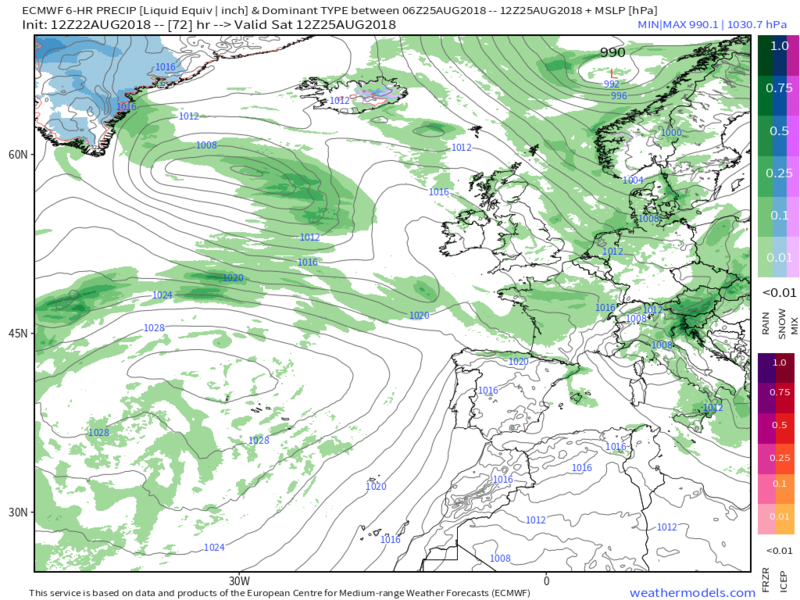 Quite a lot going on over the next few days in the transition to quite a fluid pattern and as ever the devil will be in the detail. 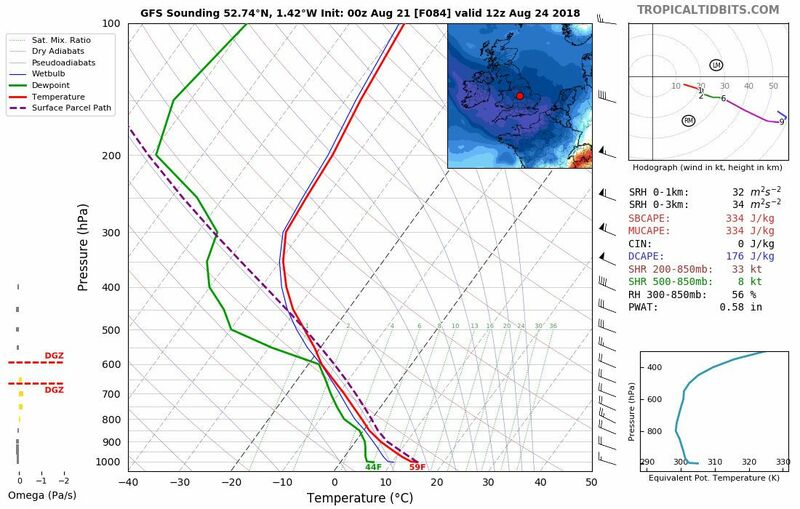 Currently the NH profile is dominated by the upper trough to the north west as much colder air is set to flow over the UK heralding a spot of Autumnal weather. 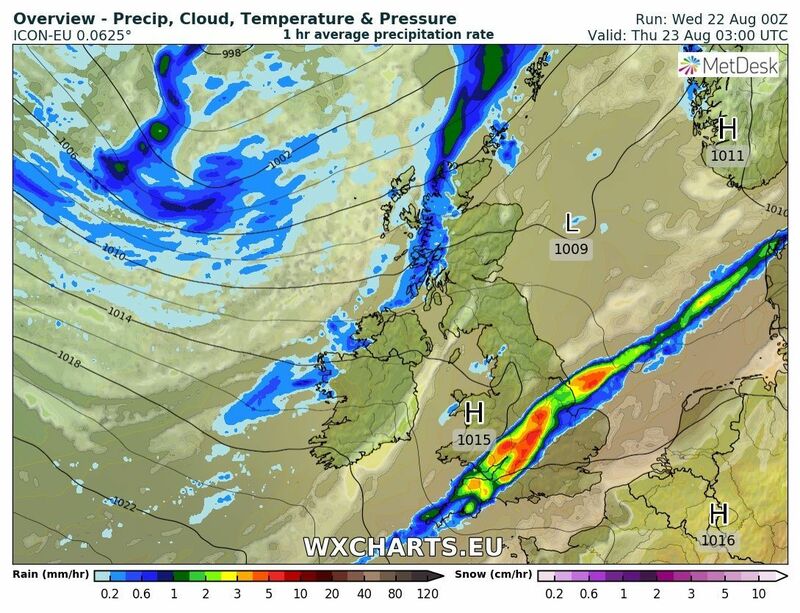 But this should clear somewhat over England and Wales giving sunny intervals in the cooler air as the cold front slowly clears the south east. 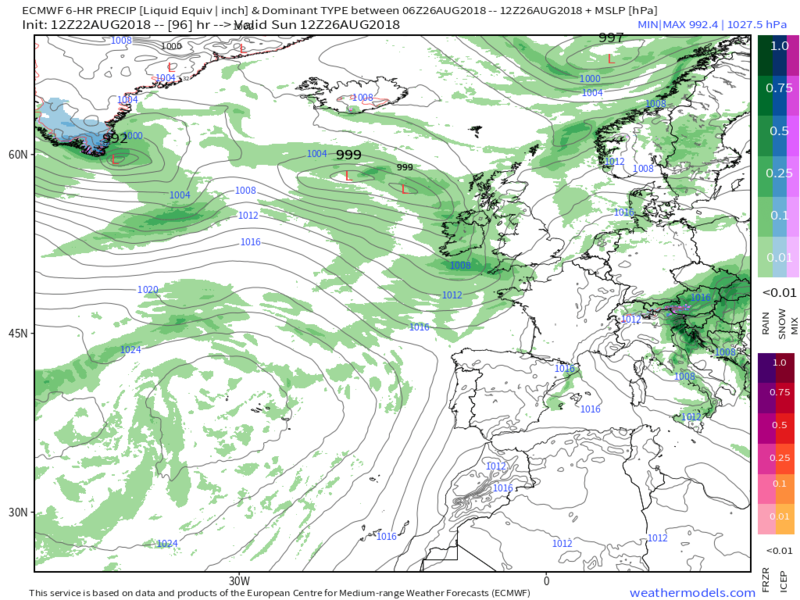 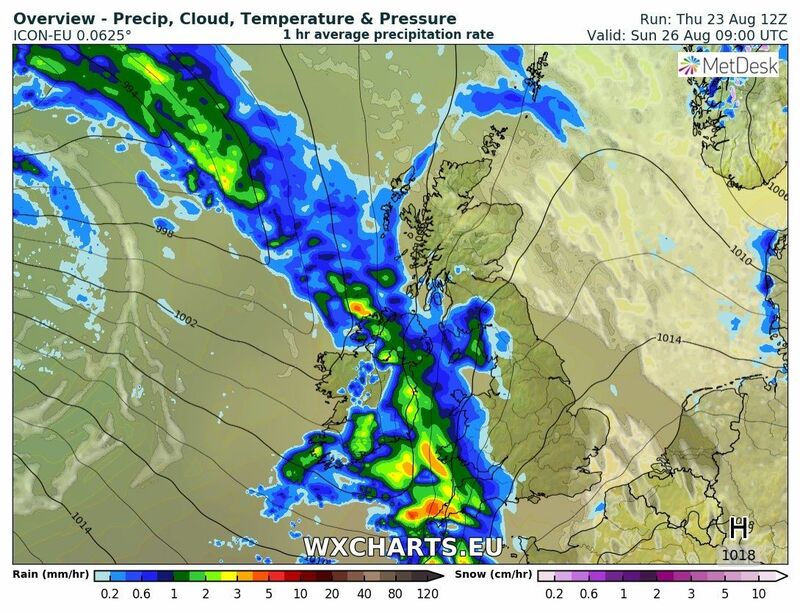 But the occlusion come cold front and associated band of rain,currently over N. Ireland Scotland, will also track south east leaving even cooler and very unstable air in it's wake heralding frequent heavy showers of rain, hail and possibly thunder.with a fresh north westerly wind. 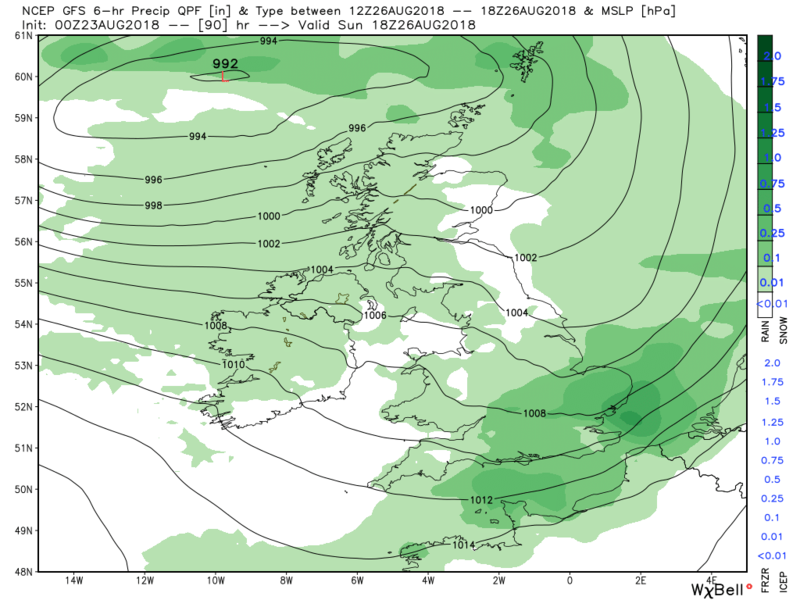 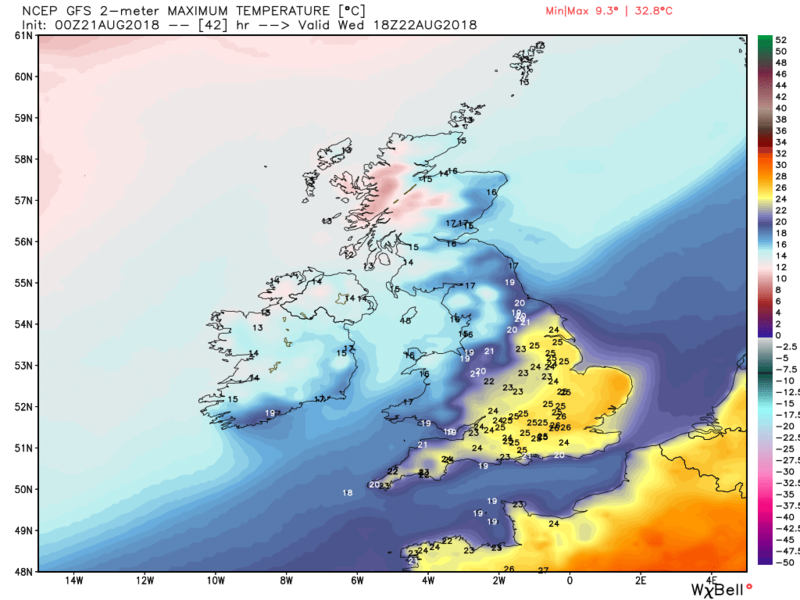 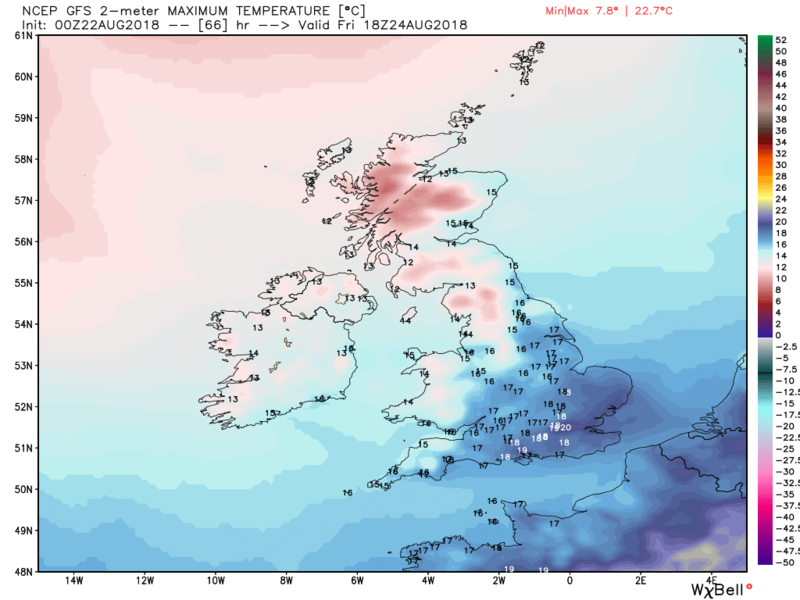 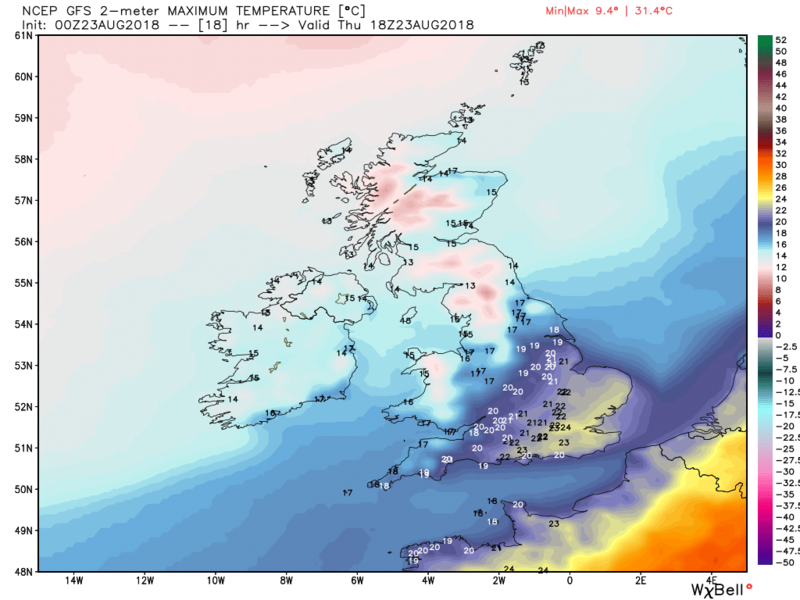 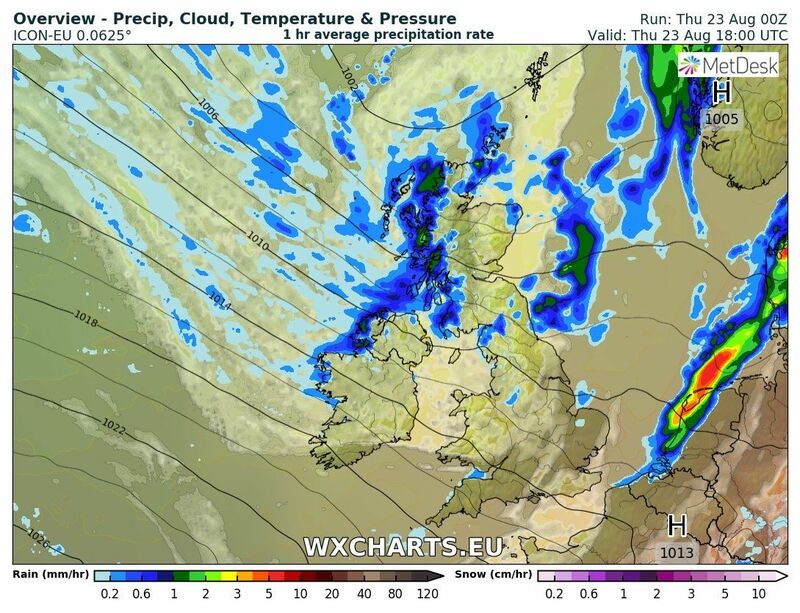 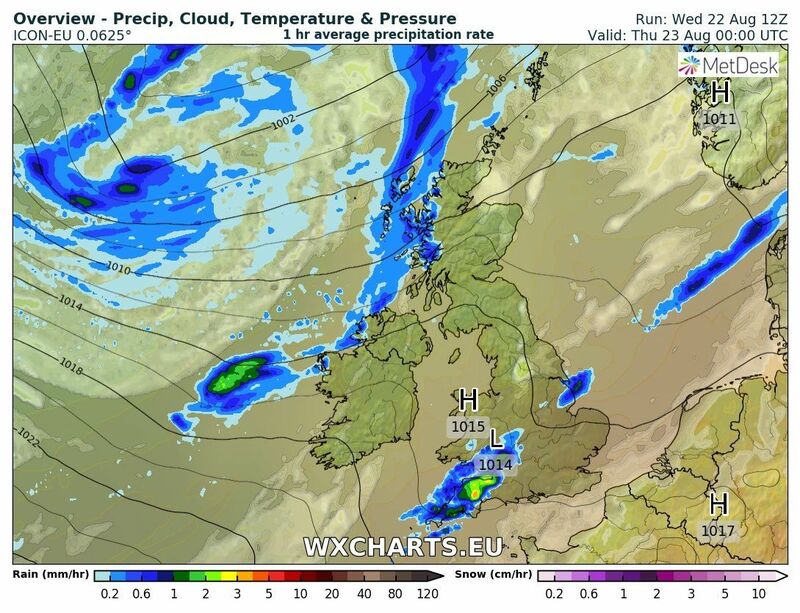 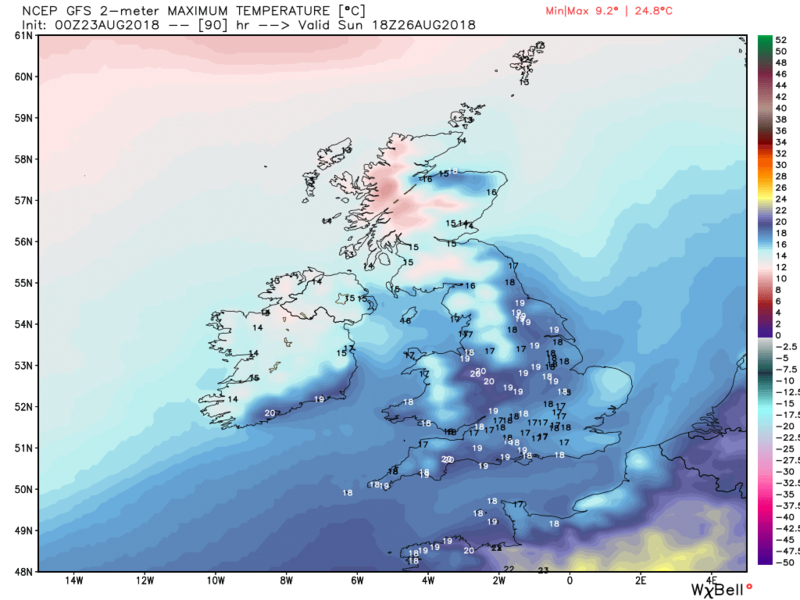 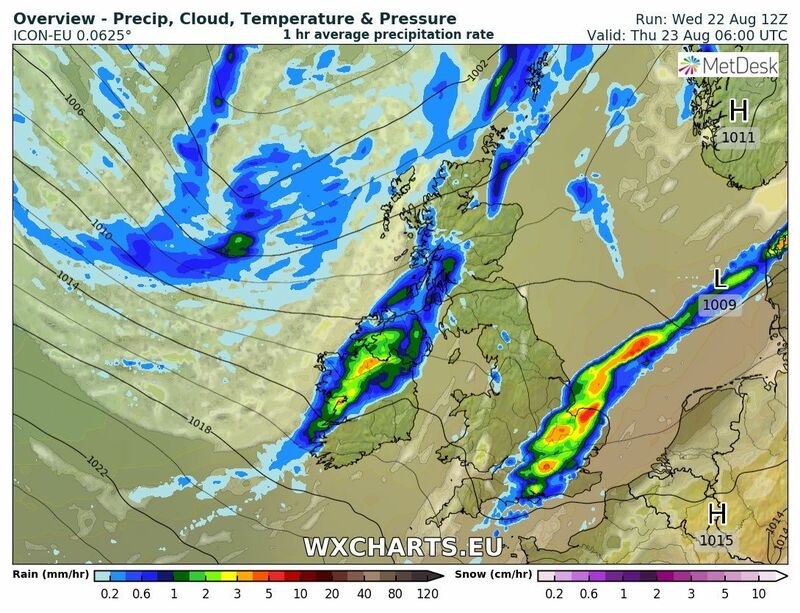 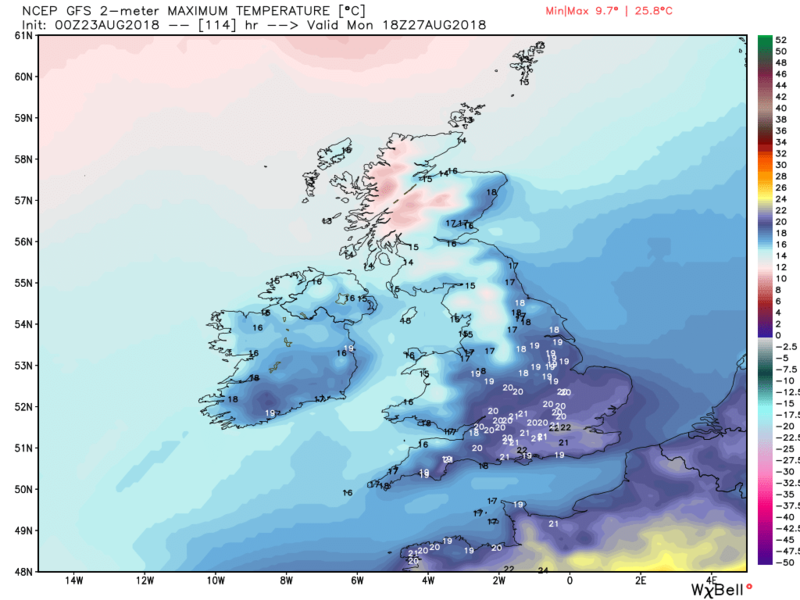 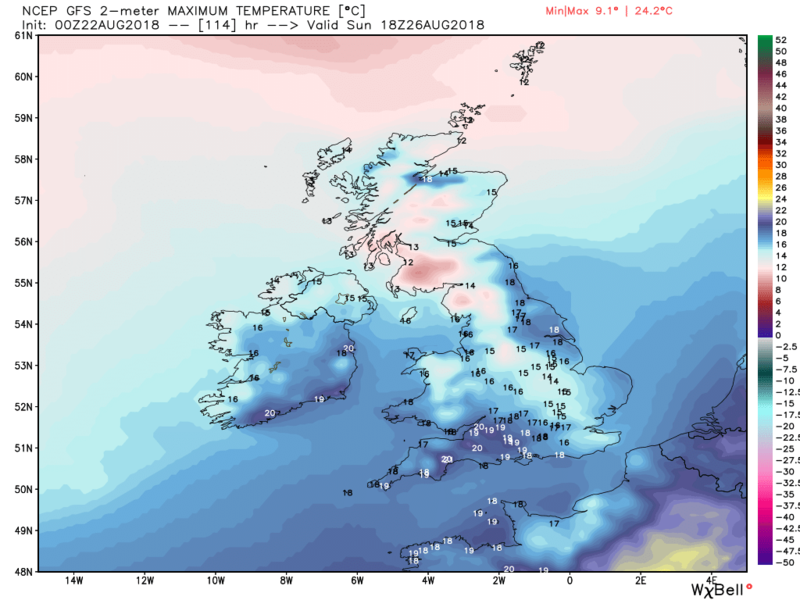 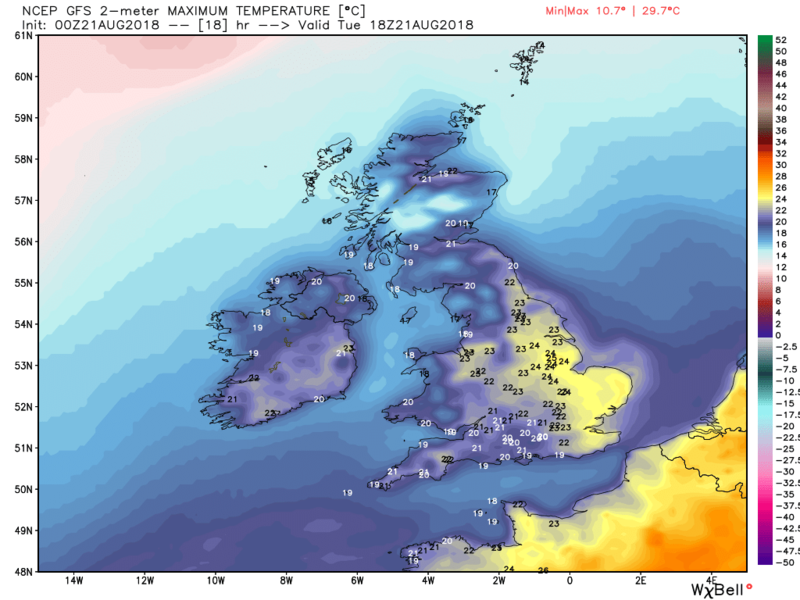 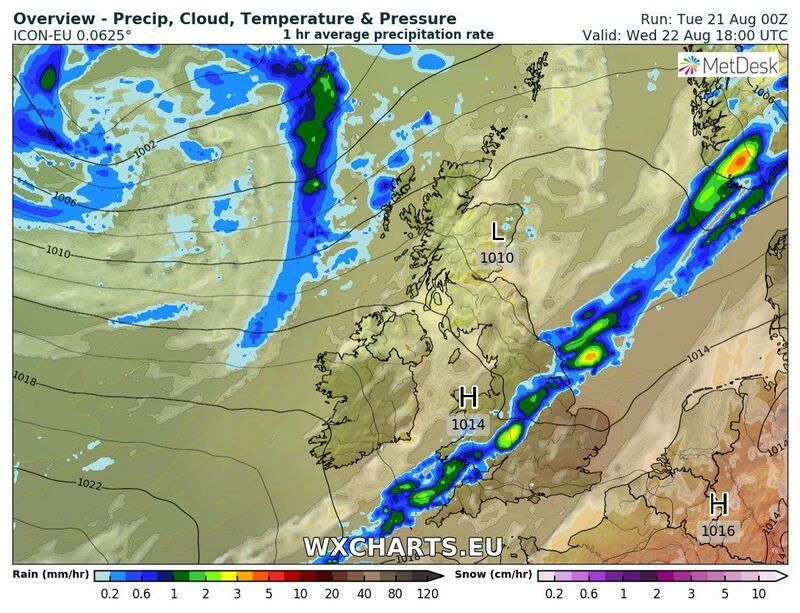 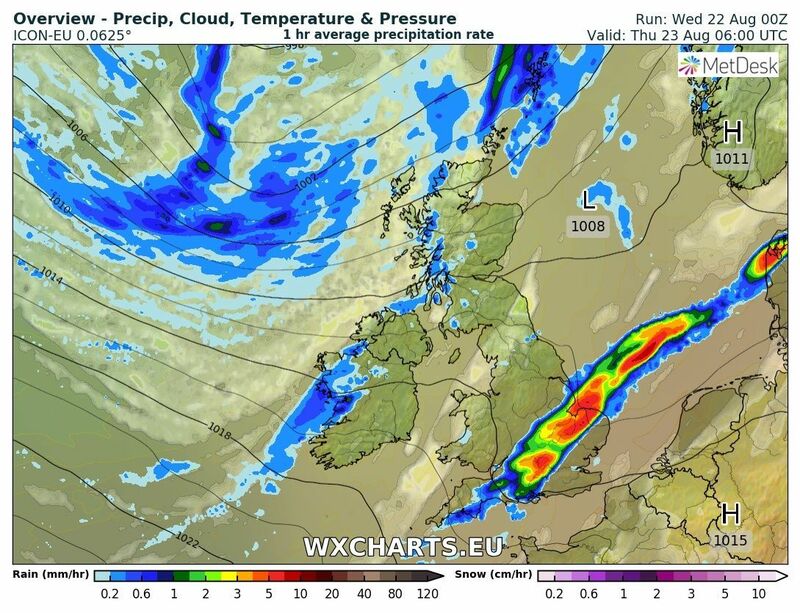 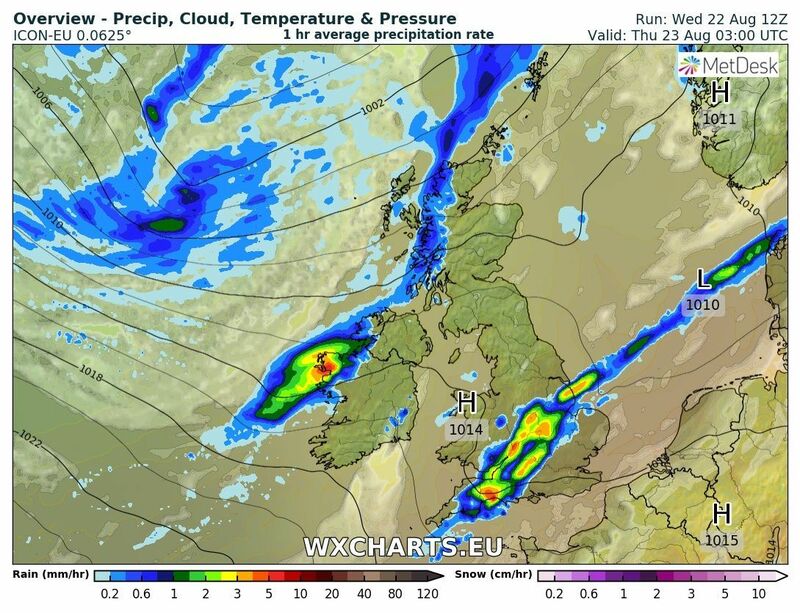 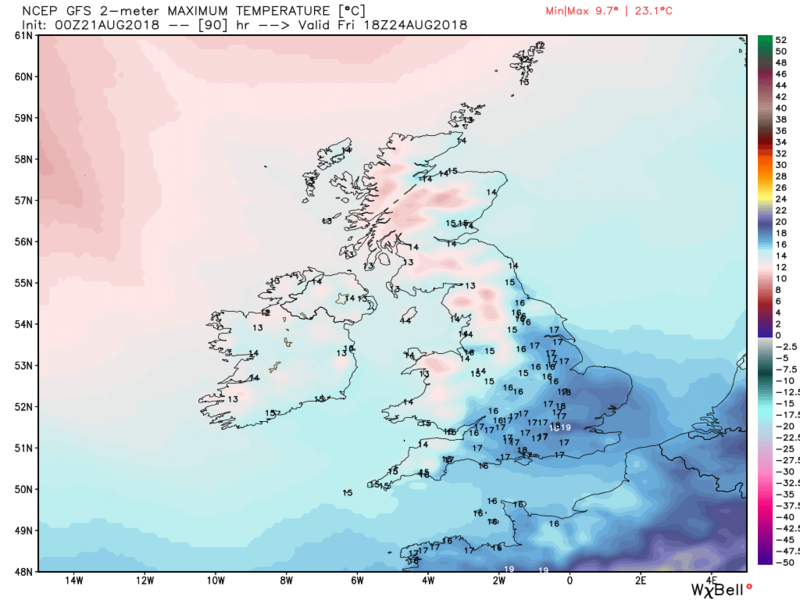 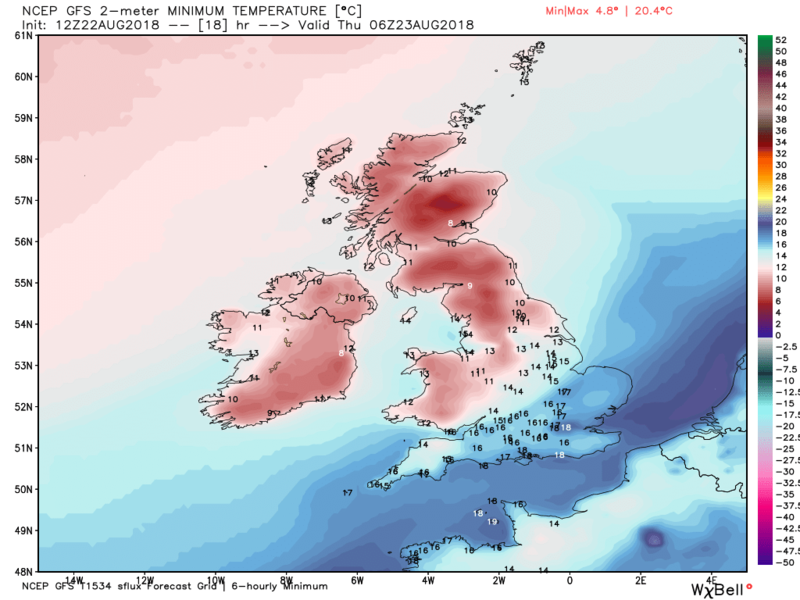 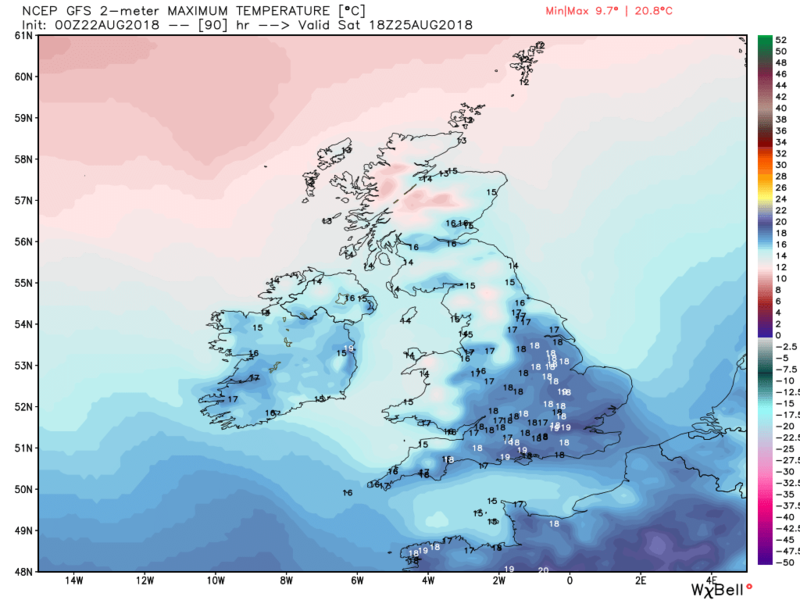 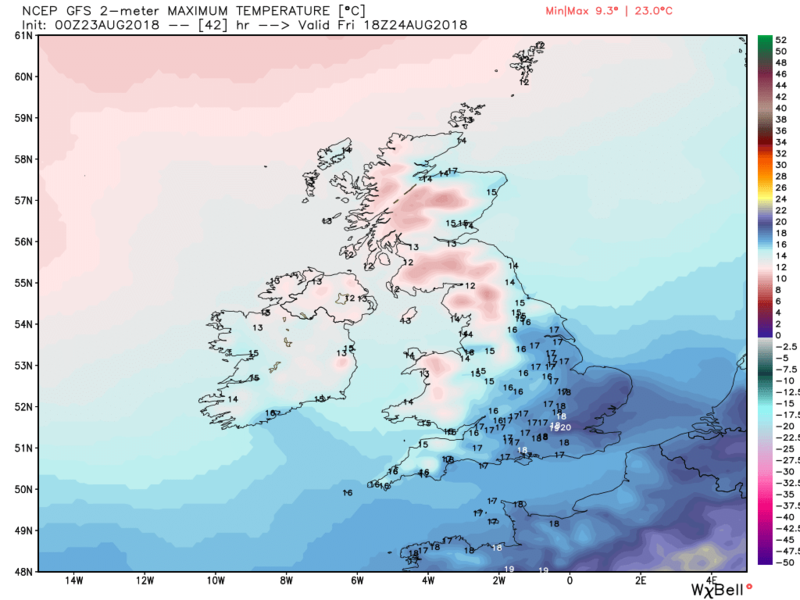 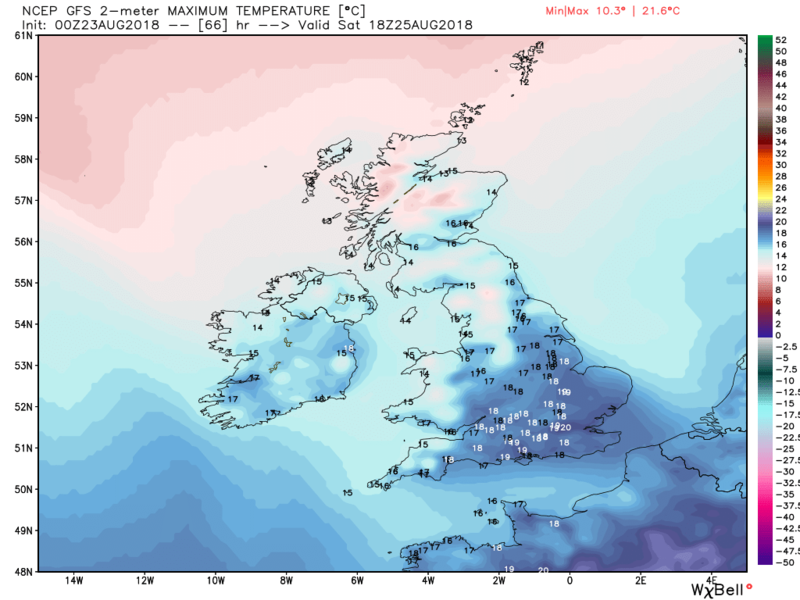 Over Thursday evening the second cold front clears the south east leaving all of the UK in a brisk and very cool north westerly on Friday and frequent heavy and squally showers that could occur virtually anywhere but will be concentrated to the north and west. 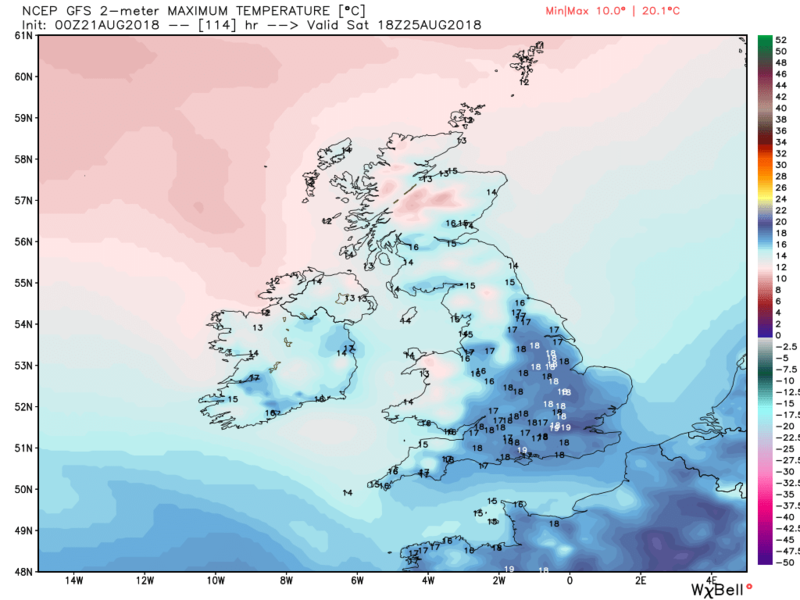 Obviously these will be intersperse with sunny intervals but temps will be below average, quite significantly so in places. 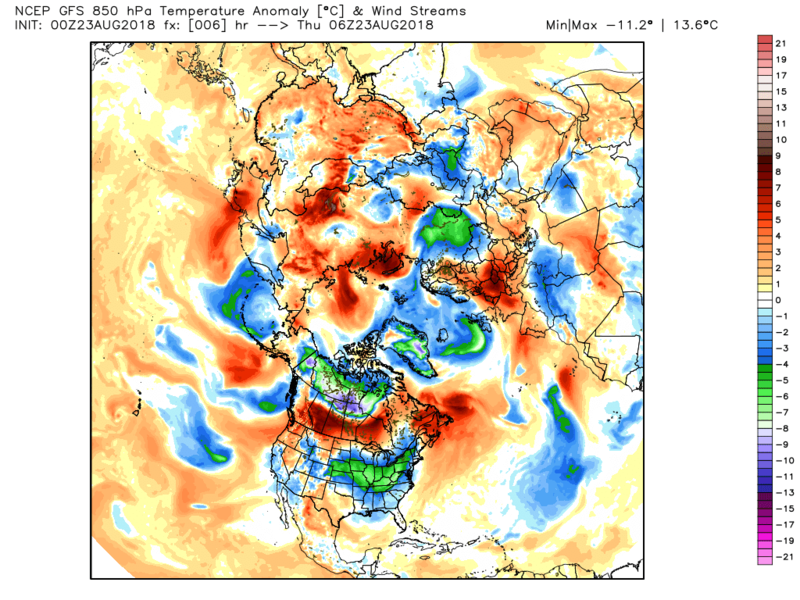  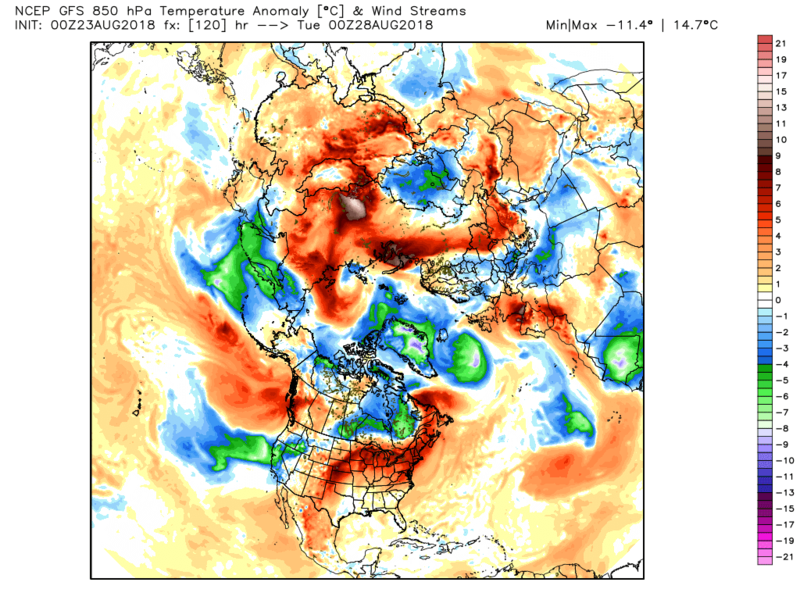 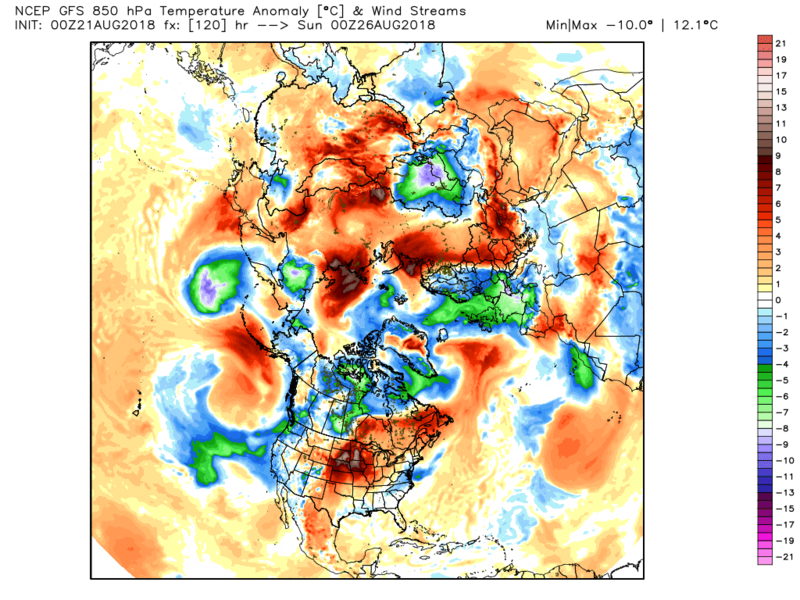 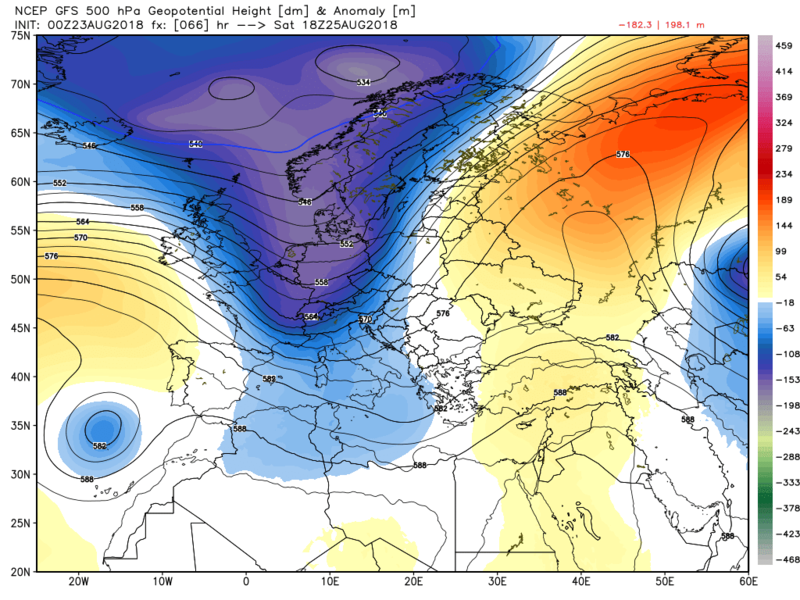 A quick muse off piste this morning and a glance at the EPS 10-15 anomaly. 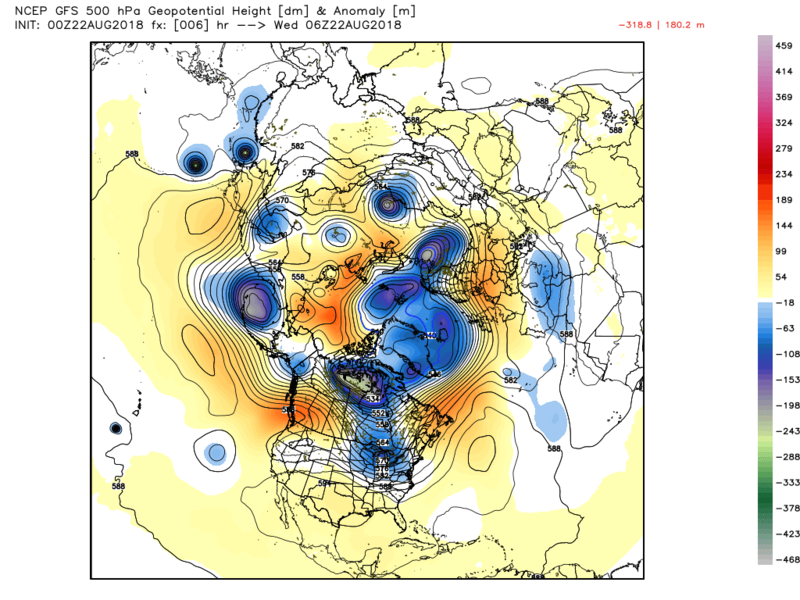 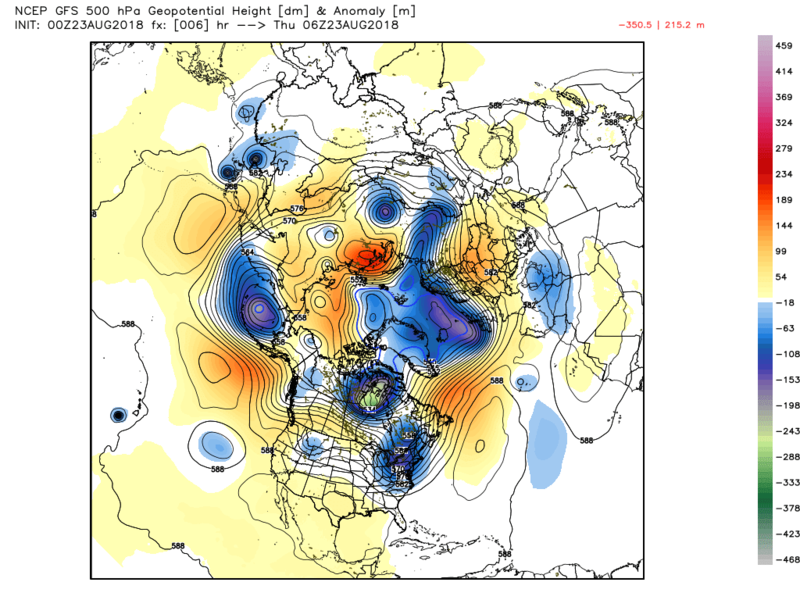 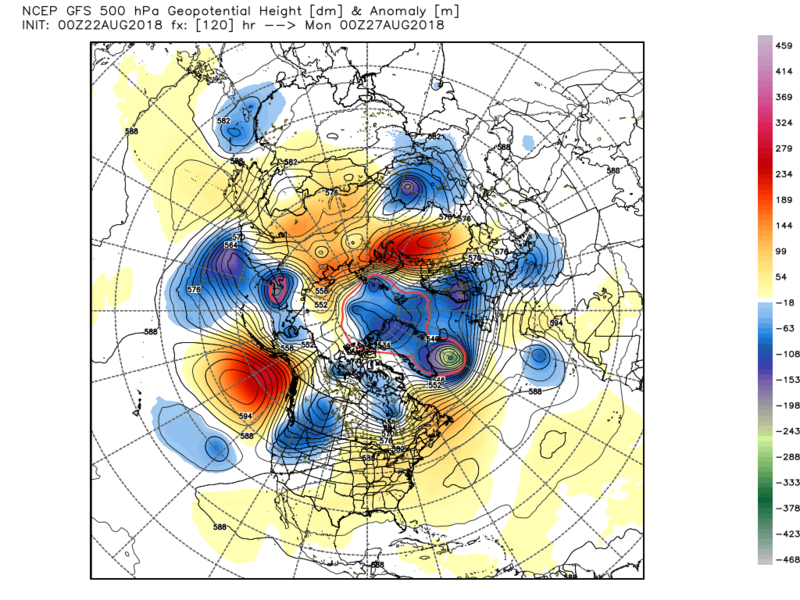 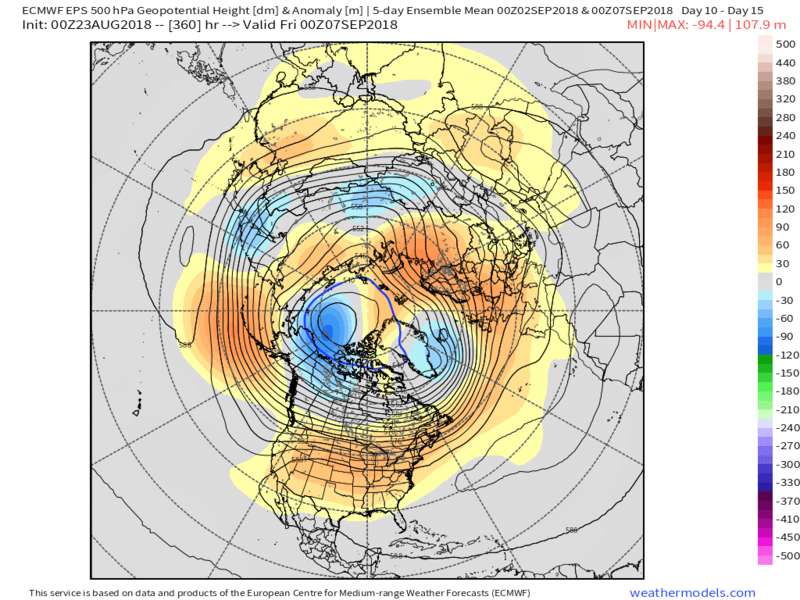 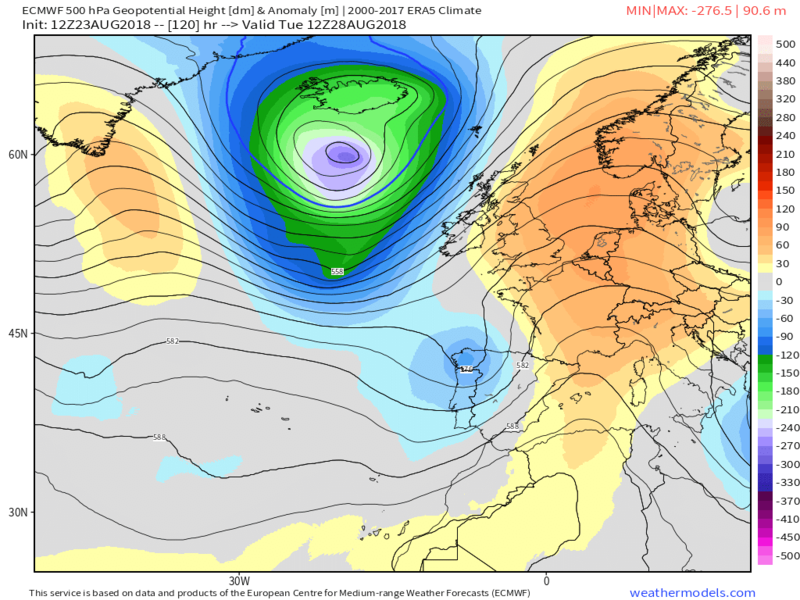 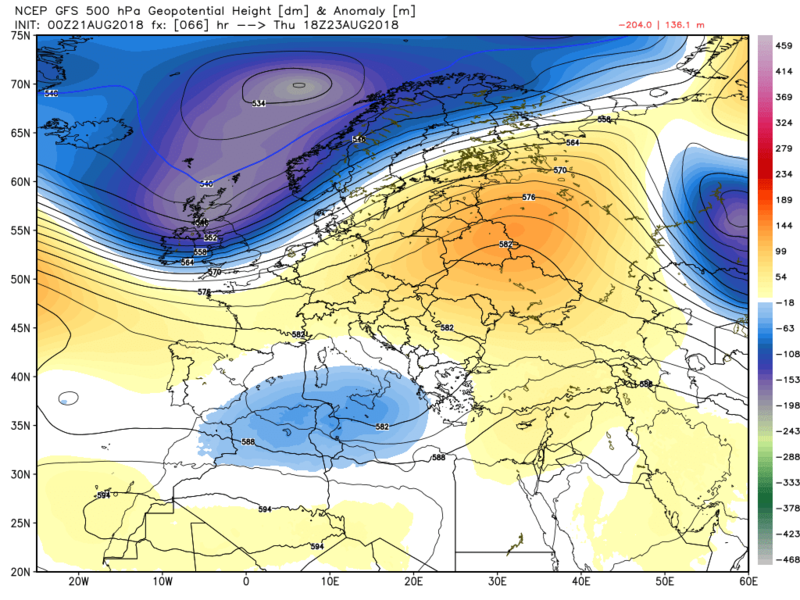 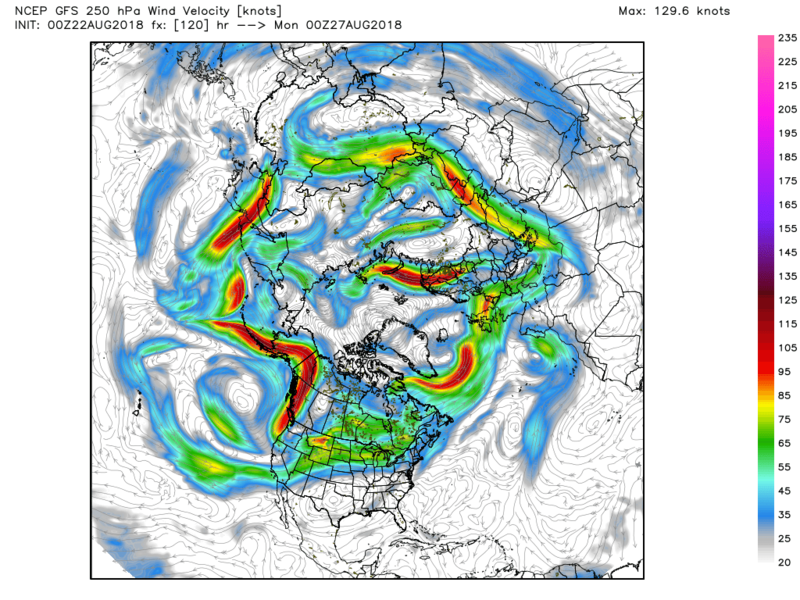 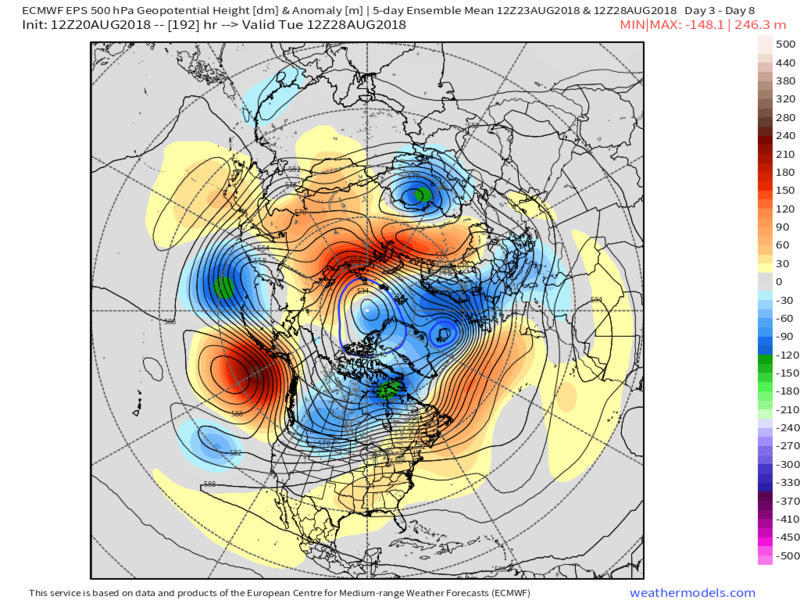 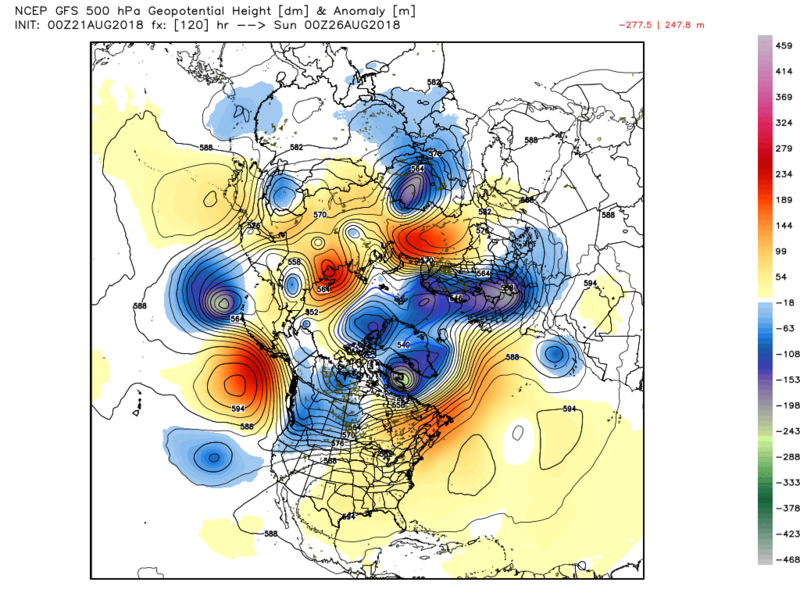 This hasn't changed a great deal over the last five days Still quite a strong westerly upper flow, with the vortex/lobe over the Arctic and associated trough down over Greenland, but weakening and diverging somewhat in the eastern atlantic courtesy of some ridging in NE Europe and a trough to the South east.Thus with the anomalies positive over NW Europe this would suggest tending towards a N/S split with some ridging over the south with perhaps temps nudging above average. 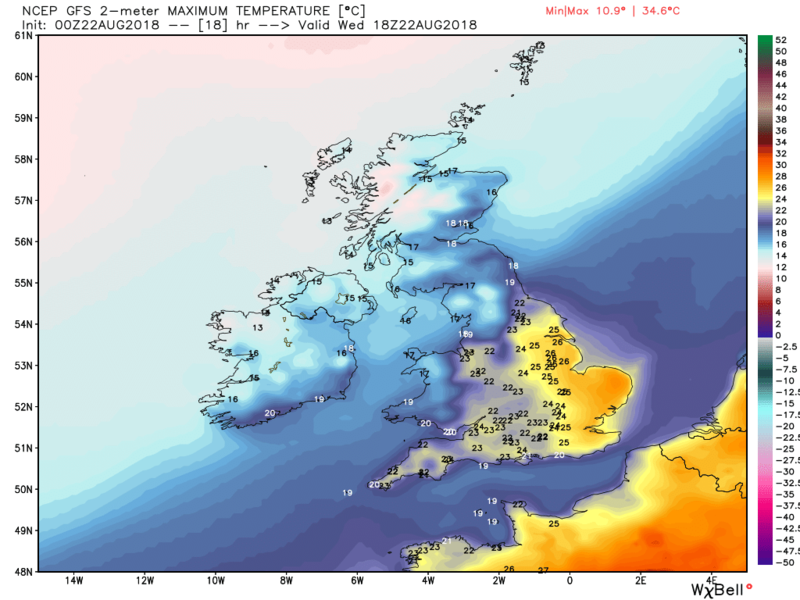 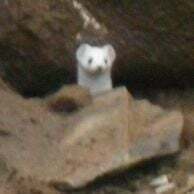 Interesting high res. 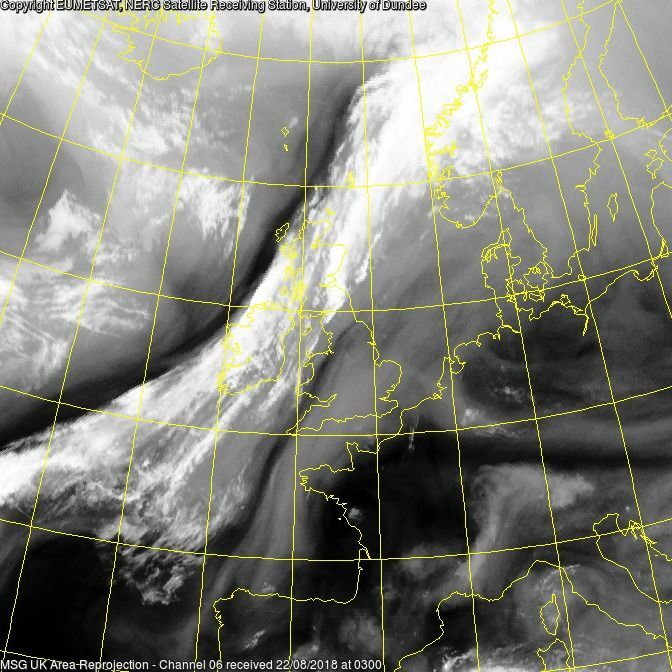 MODIS at midday. 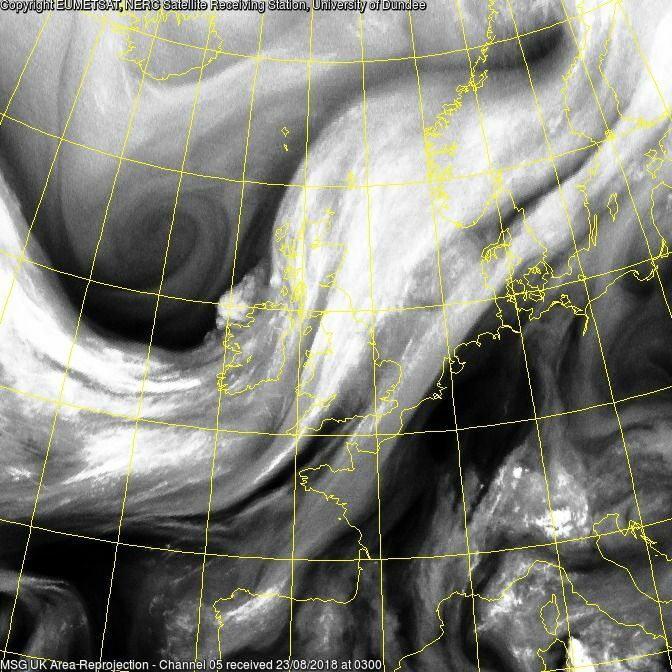 Not a bad morning here but medium layer cloud has encroached over the last couple of hours. 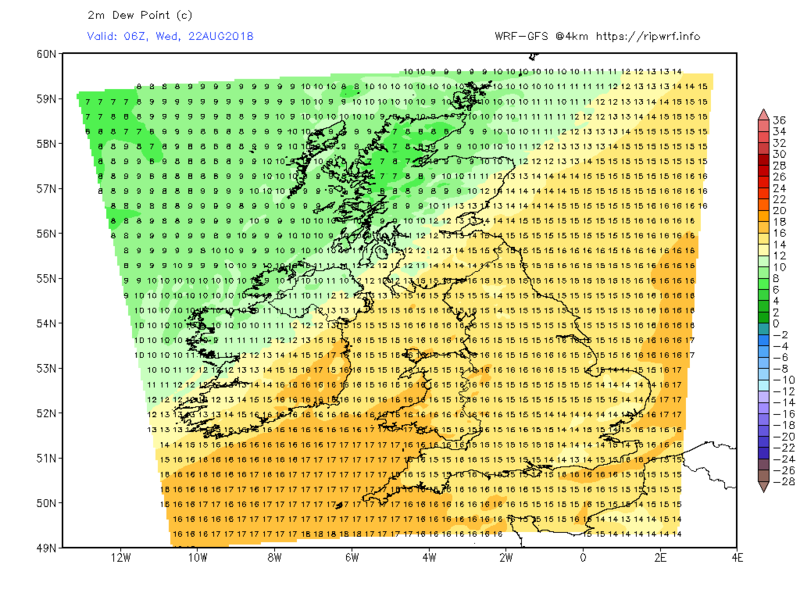 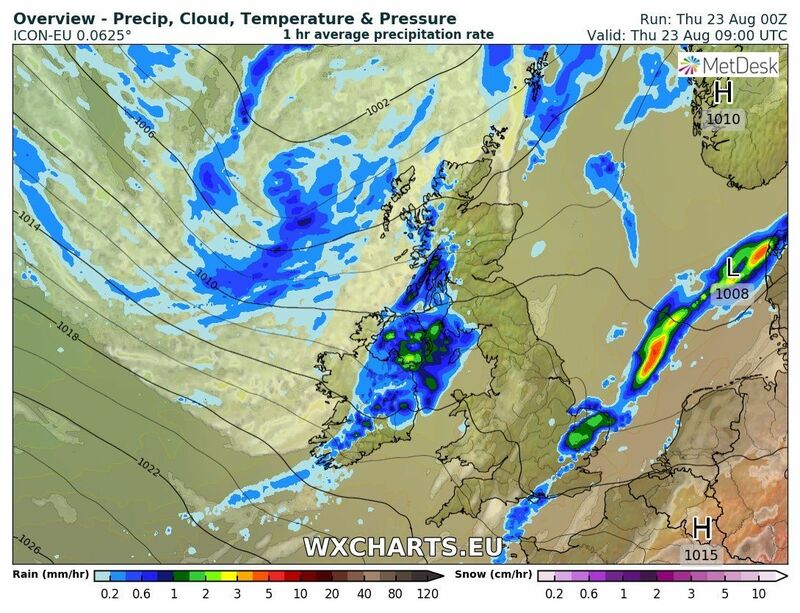 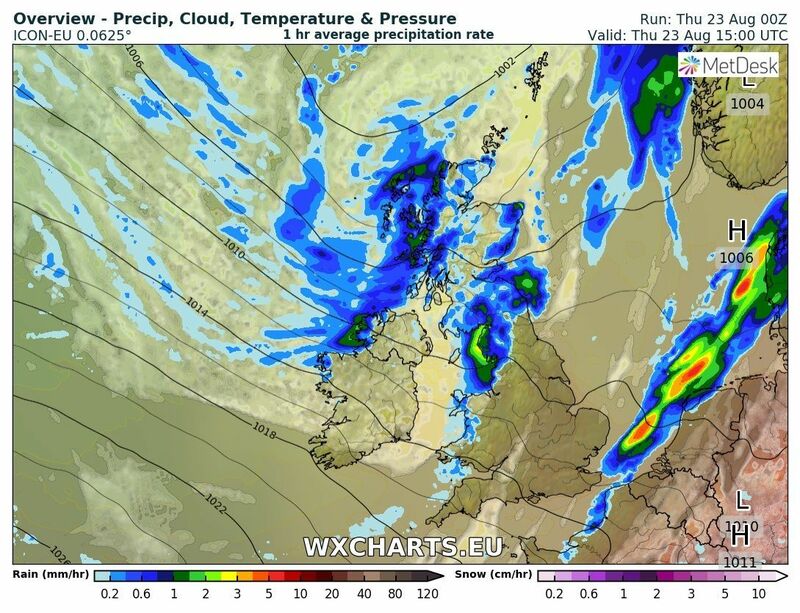 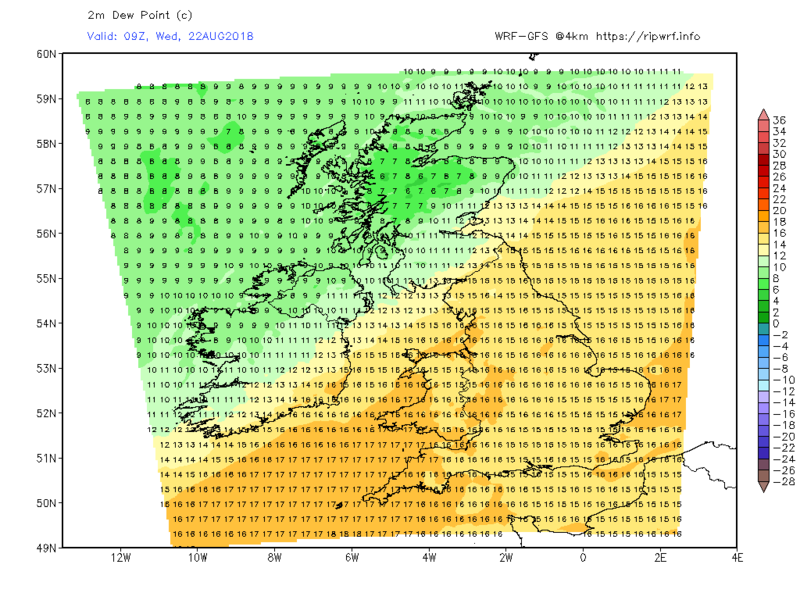 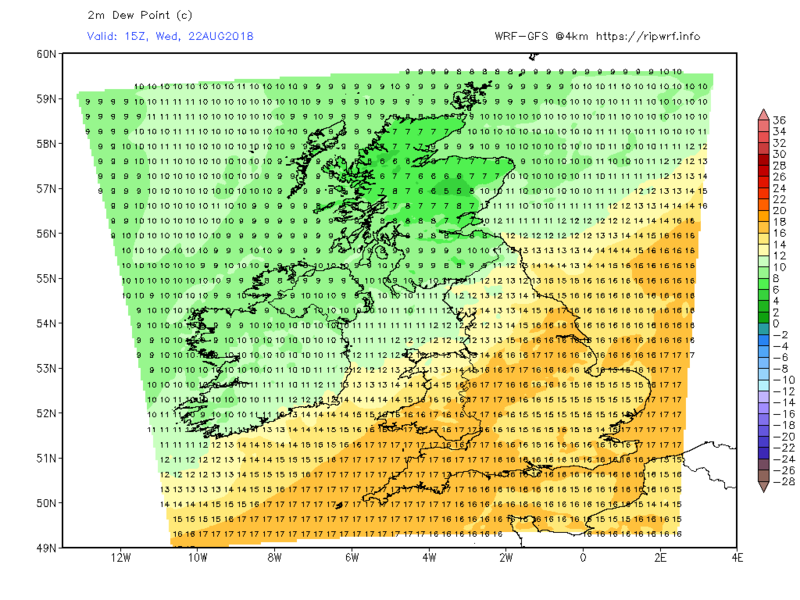 Later tomorrow a concentration of hefty showers in the south west perhaps? 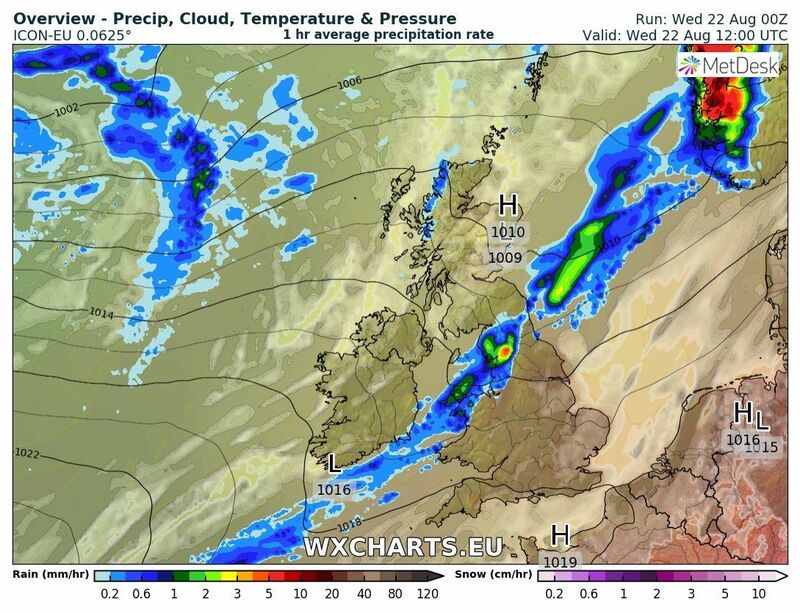 Guess who is going on a day trip to the South Devon Railway on Sunday?